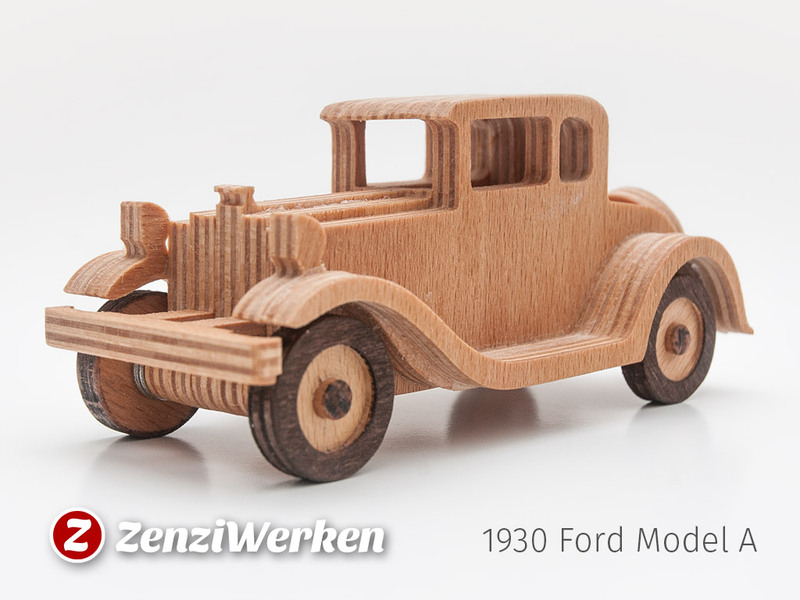 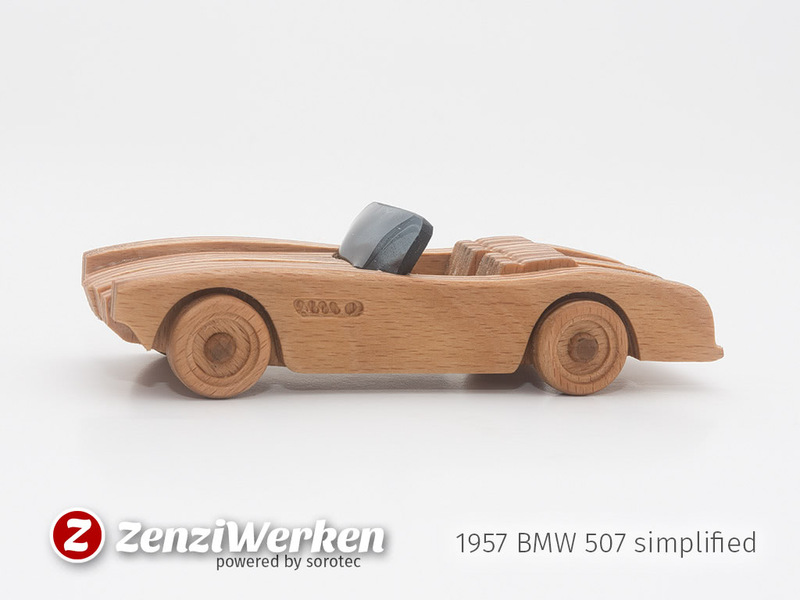 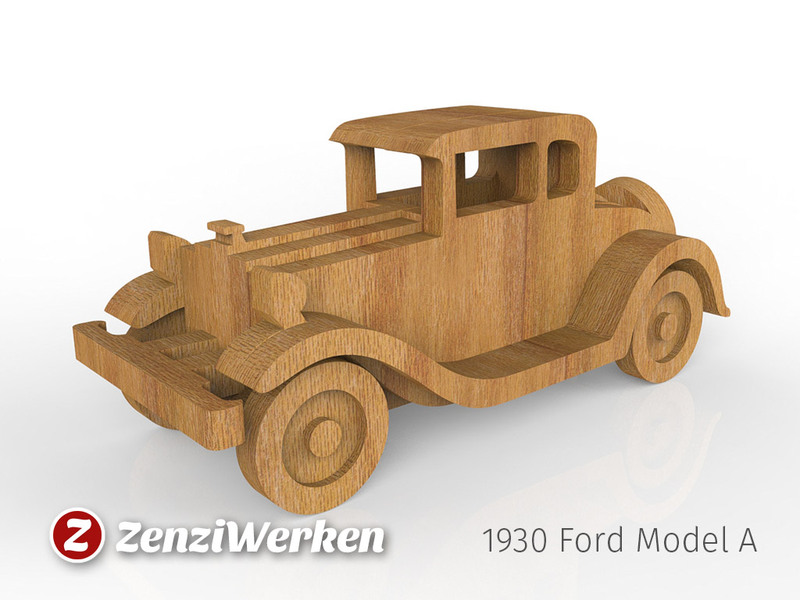 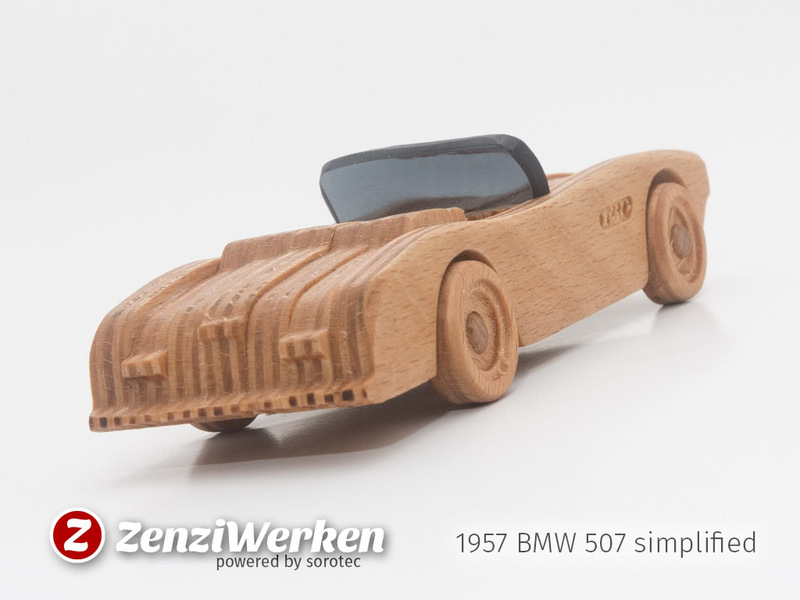 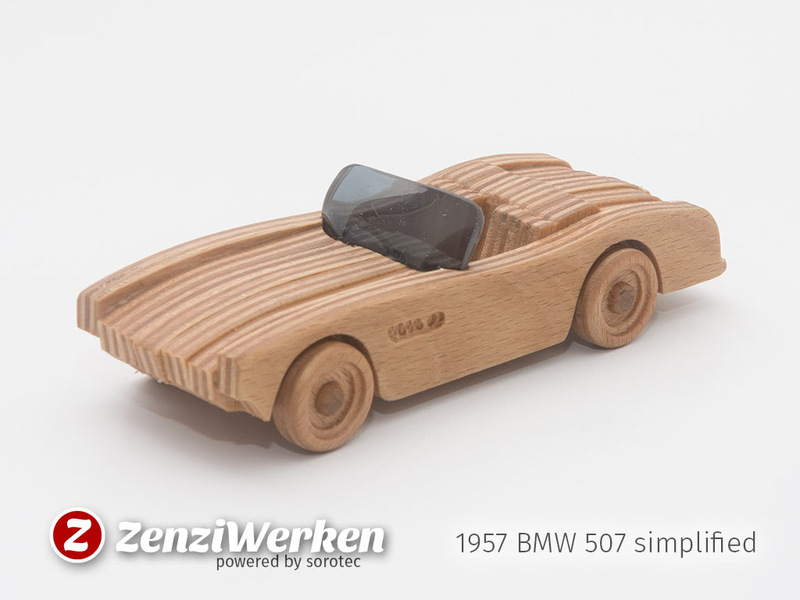 After quite a few nice plane models I started to create car models. 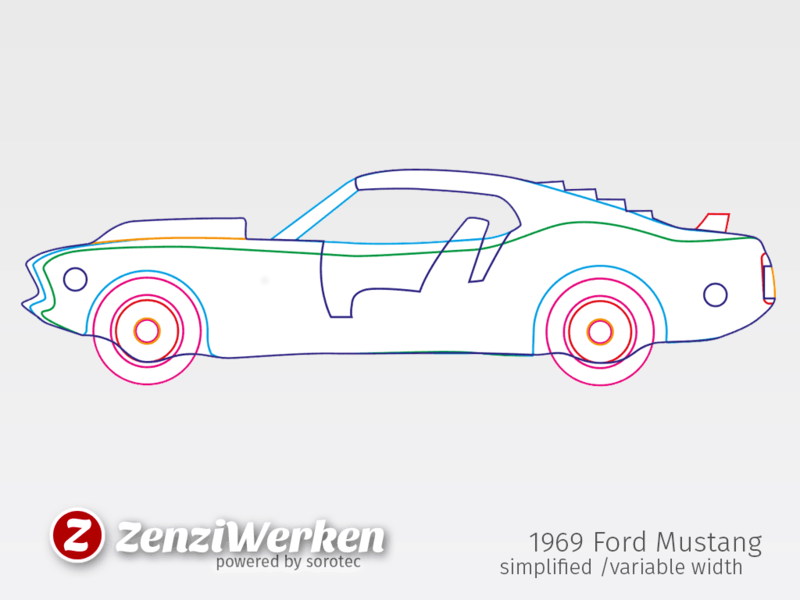 They are roughly sorted by year. 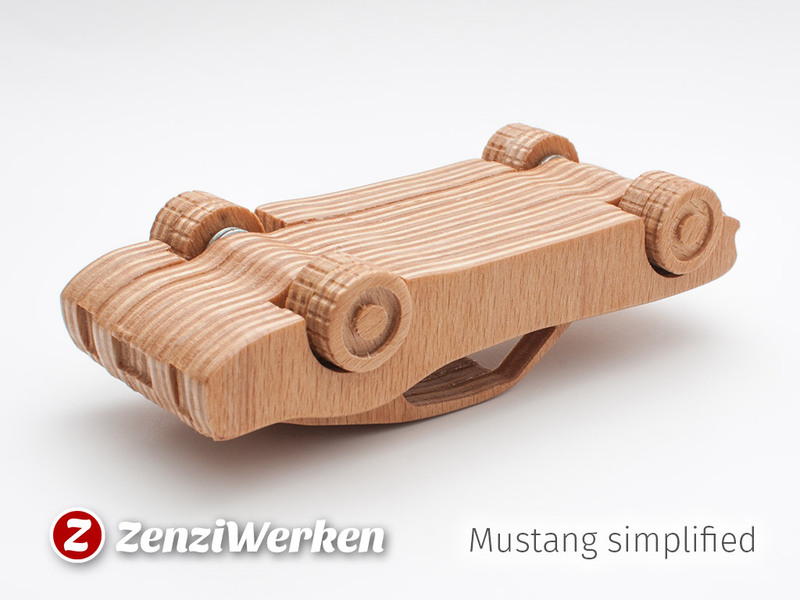 Please note that I am not a car savvy whatsoever. 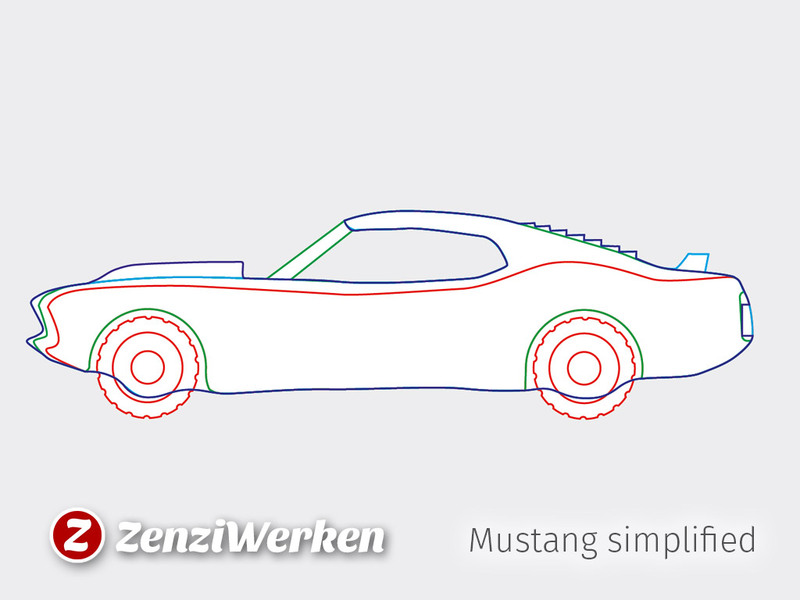 If you know details you think I should add, just let me know. 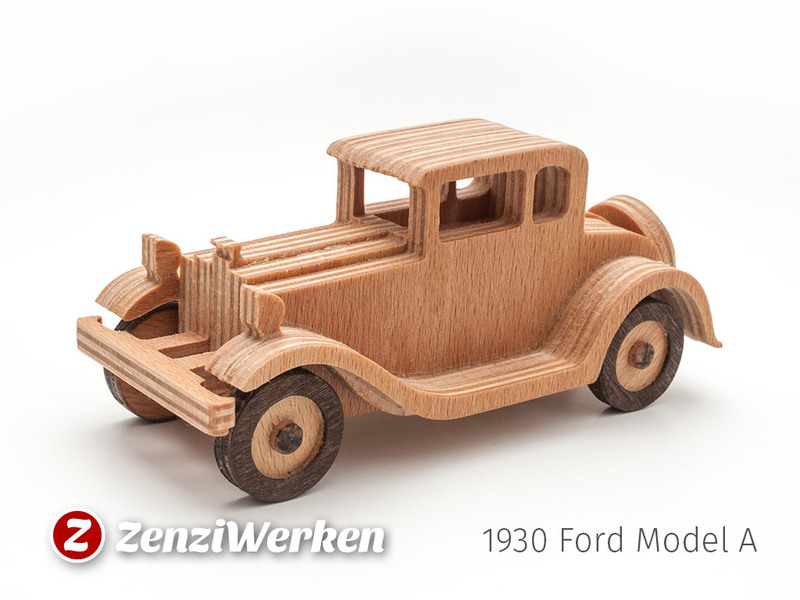 The successor of the legendary Model T that started the assembly line revolution, this car is my epitome of a vintage car. 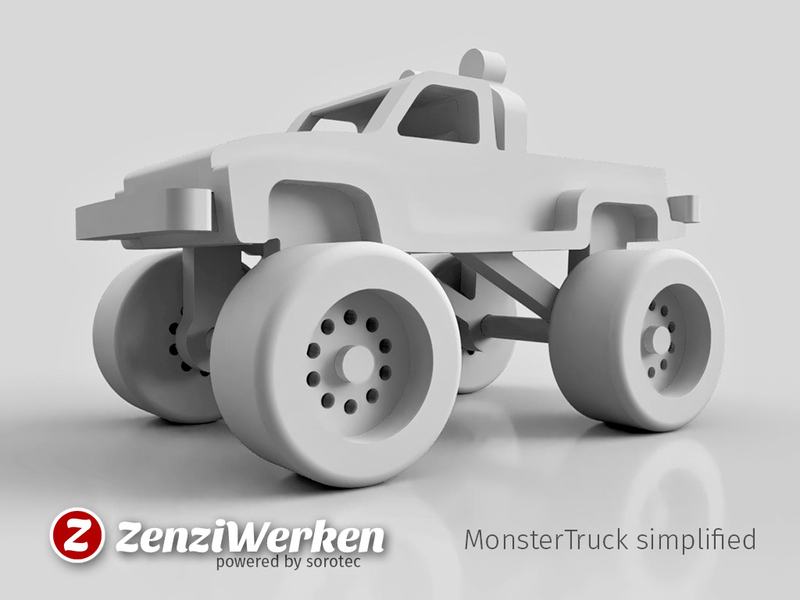 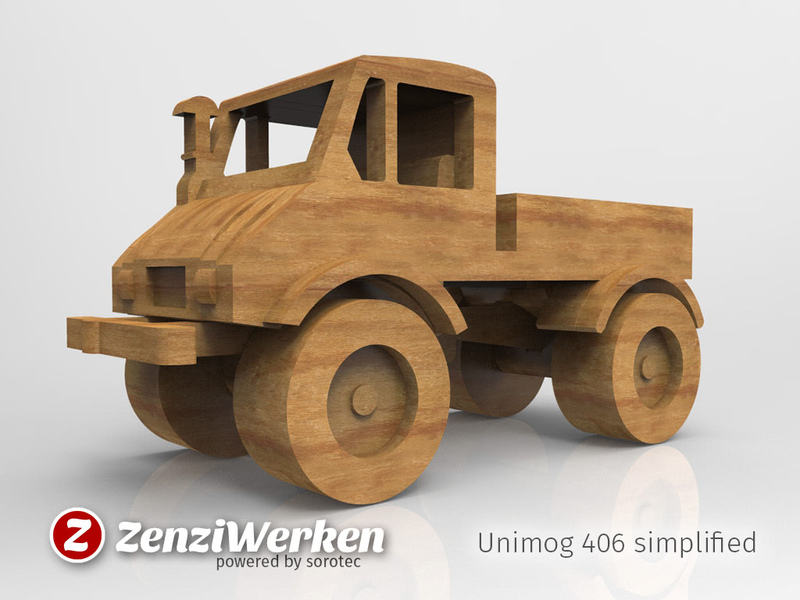  Download at Thingiverse Timelapse of a build buy me a coffee commercial license? 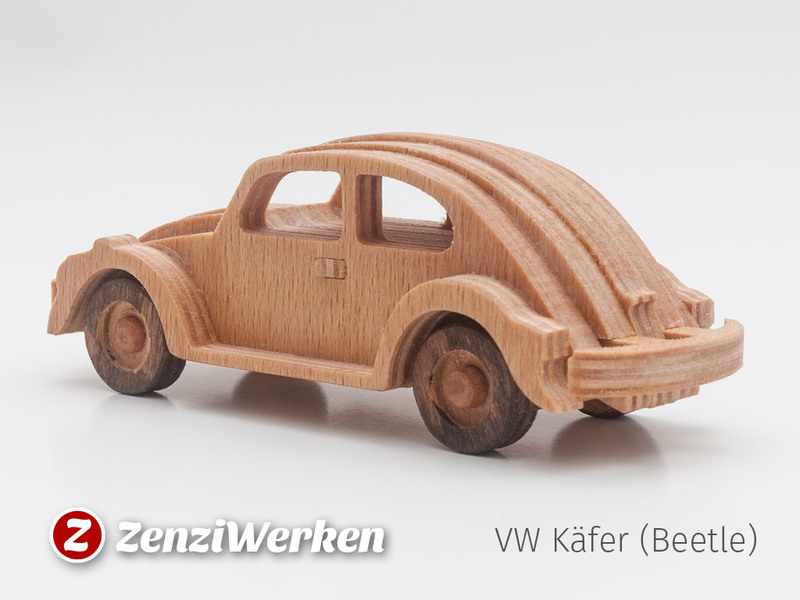 The VW Beetle is one of the best selling cars in the world. 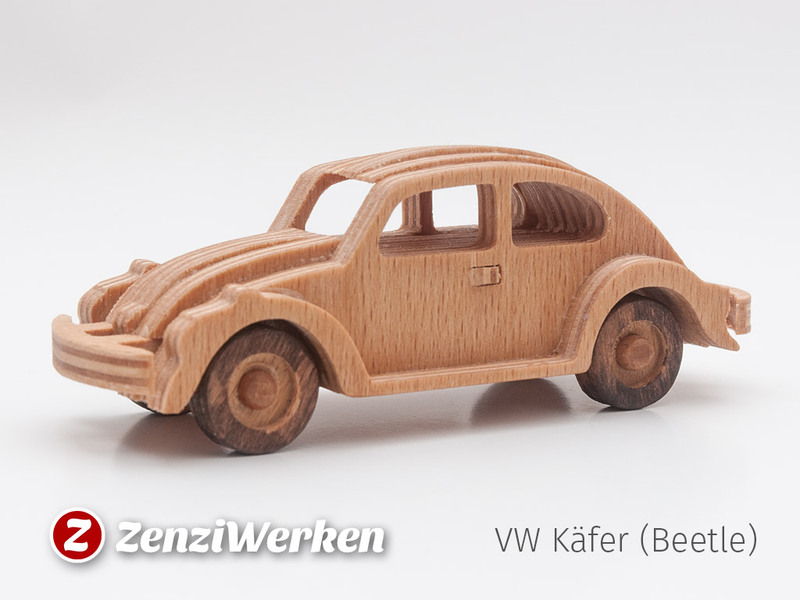 Over 21 million cars were built by the German manufacturer Volkswagen. 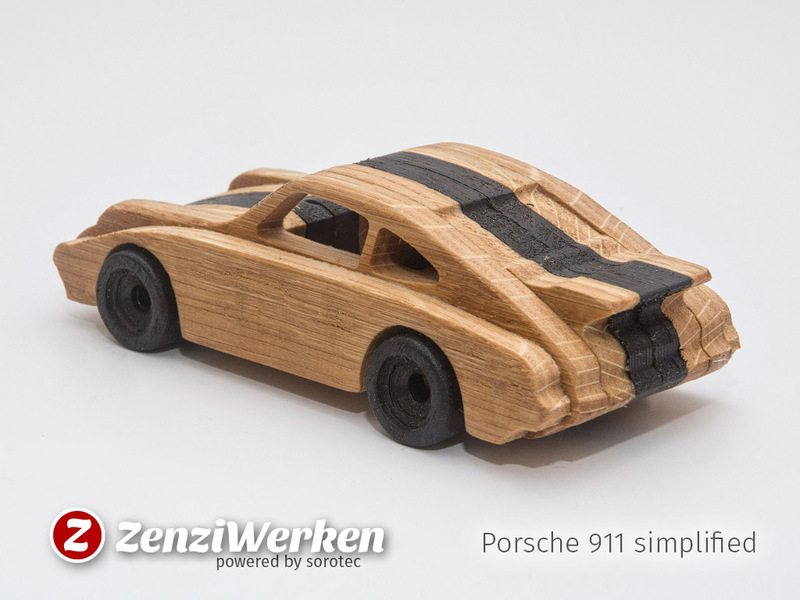 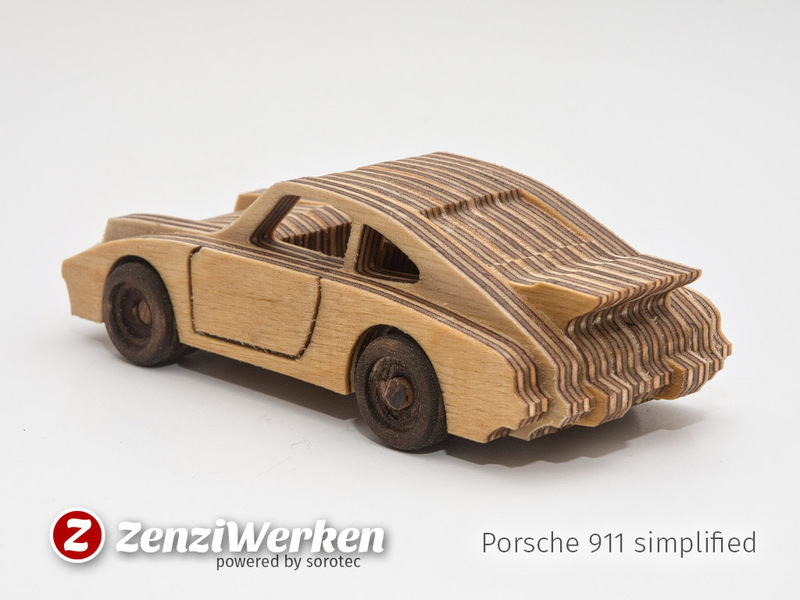 It's streamlined shape, the air-cooled engine with the distinctive sound and the trunk in the front are the most noticeable features. 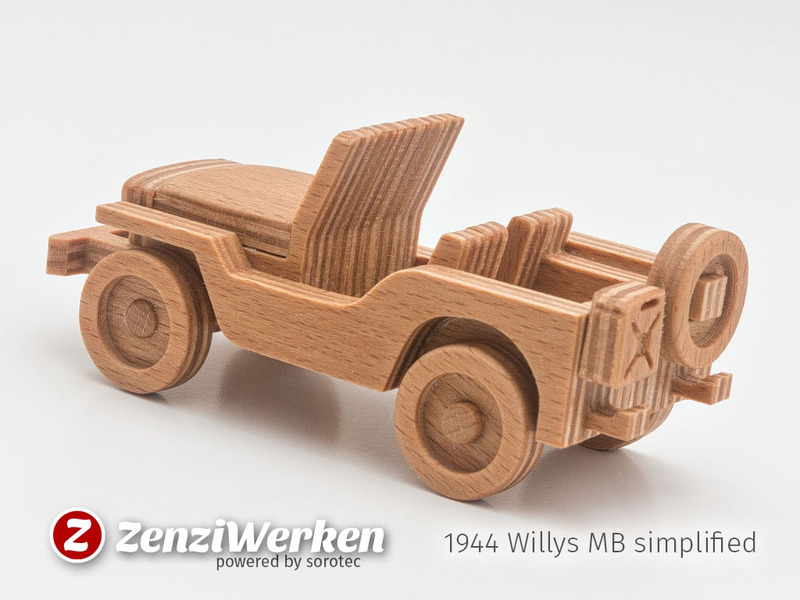 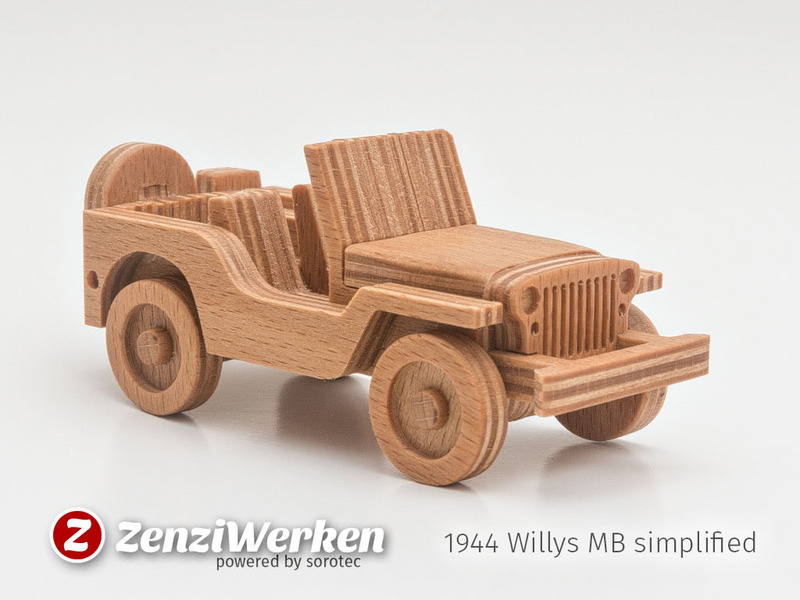 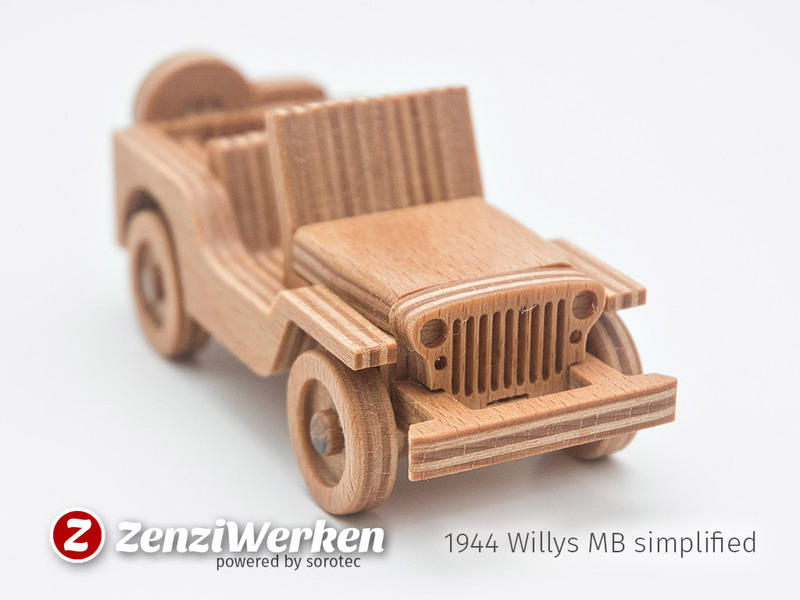 The forefather of the Jeep is the Willys MB. 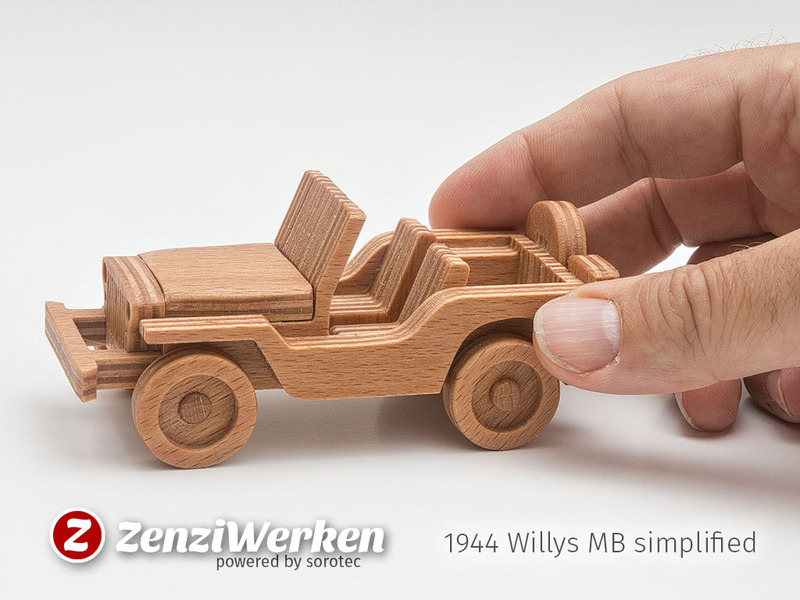 Developed in the 1940s this 4x4-truck was supposed to be small, relatively cheap and produced in large quantities. 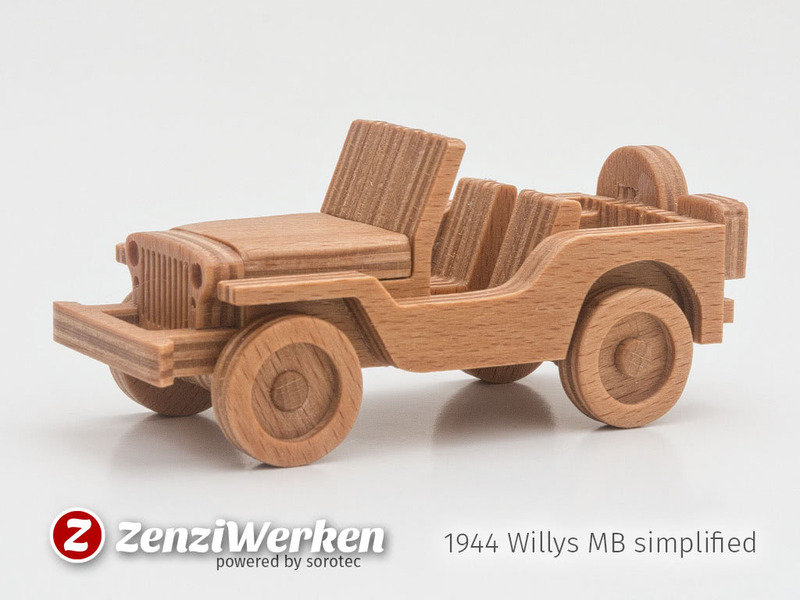 The soldiers loved the vehicle for its endurance and agility. 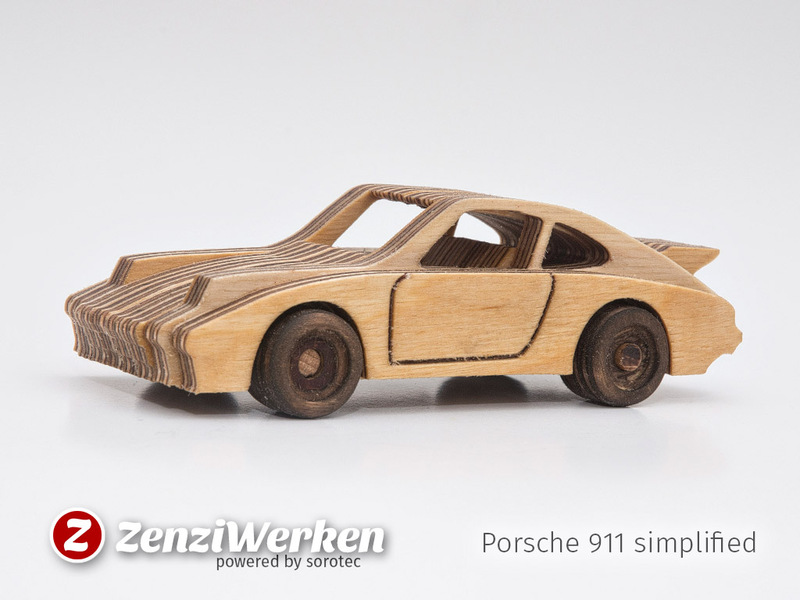 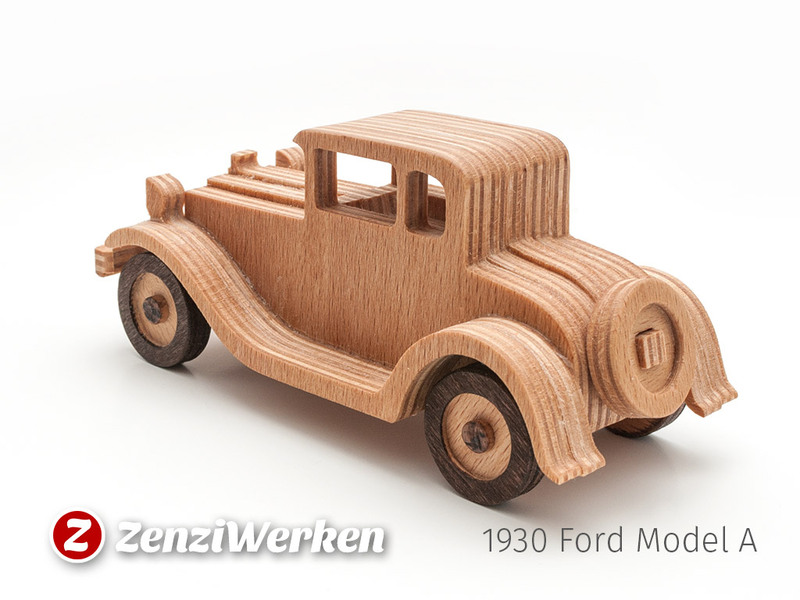 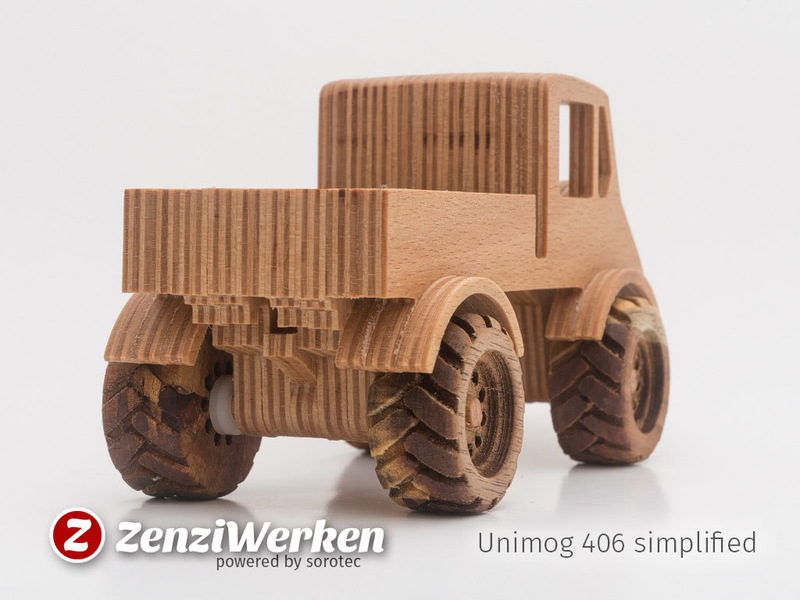 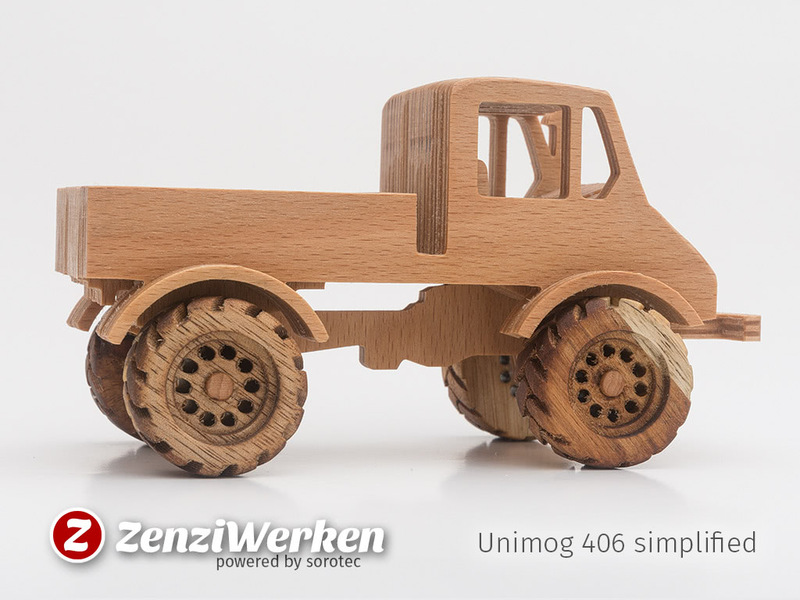 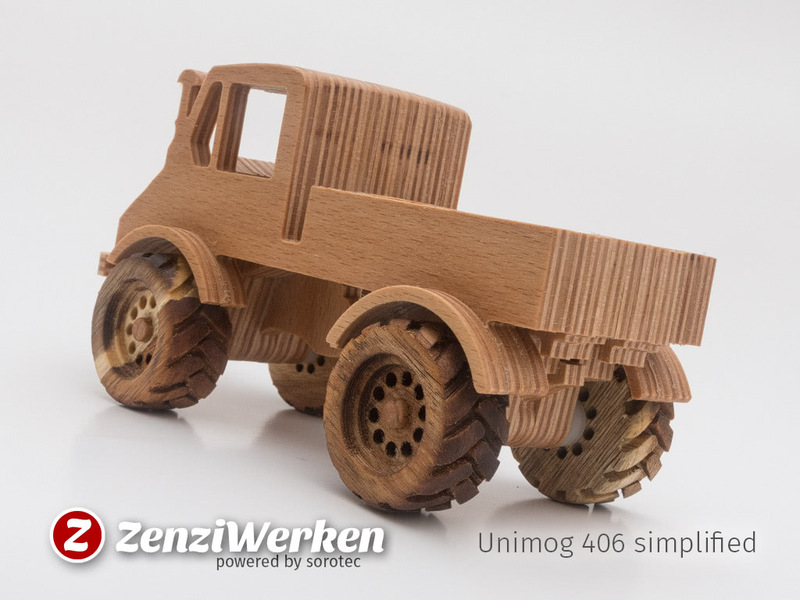 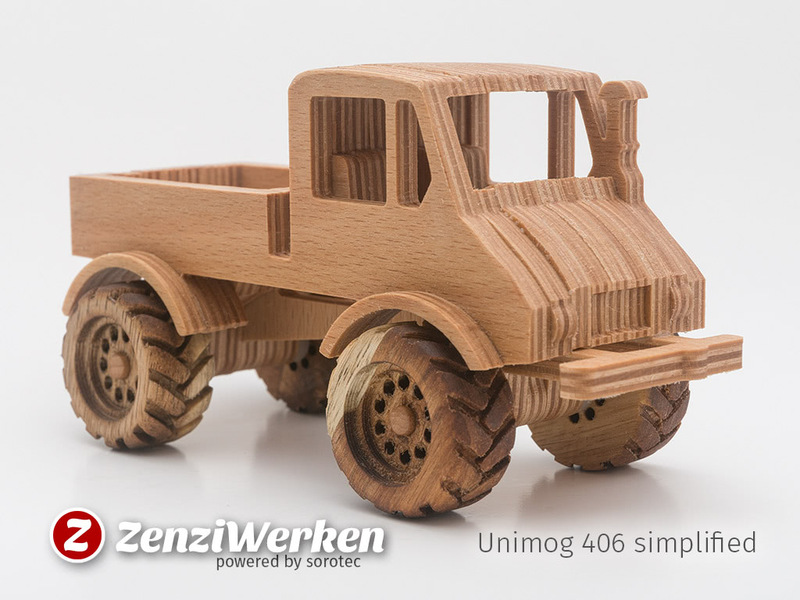 This tiny model, made from seven layers of plywood sports the distinctive features like the nine-slot steel grille, the spare tire and the gasoline canister mounted on the back. 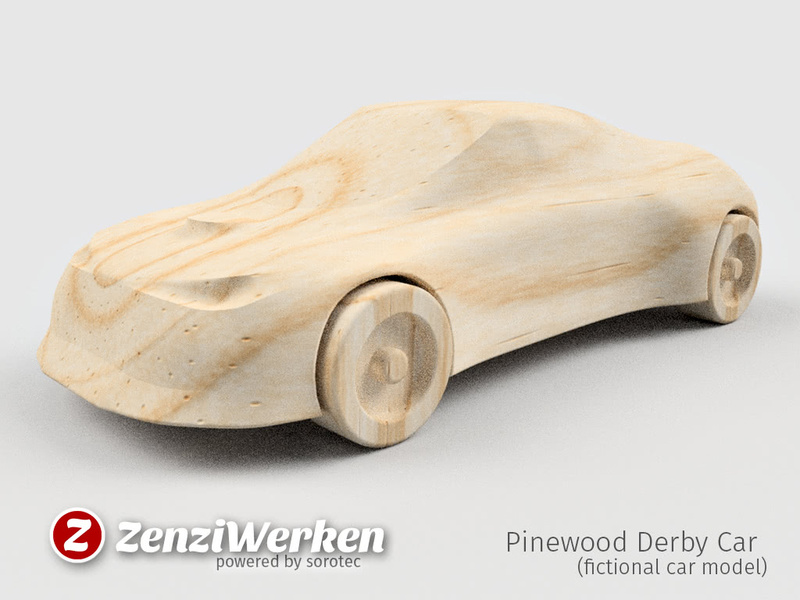 I decided against adding more details (like the steering wheel) because it would have resulted in to fragile elements. 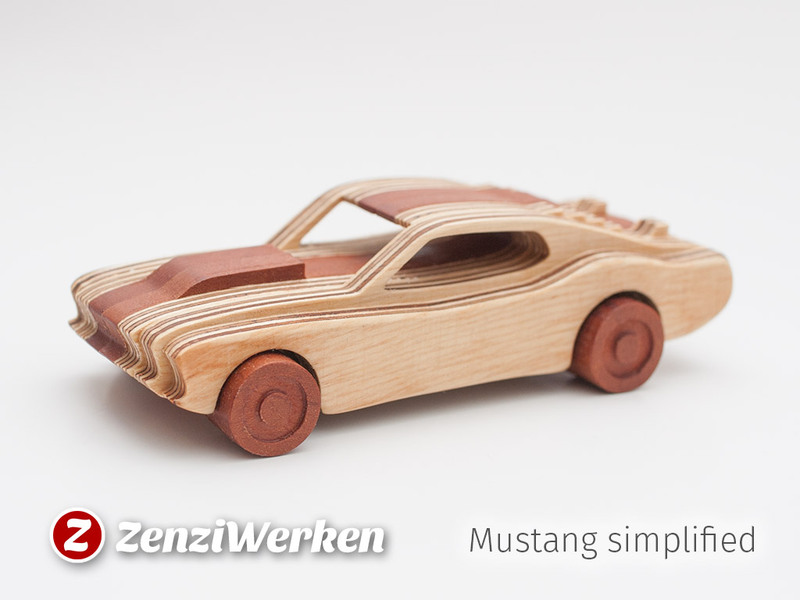 The glue-up is still a little tricky, but the parts are cut really fast. 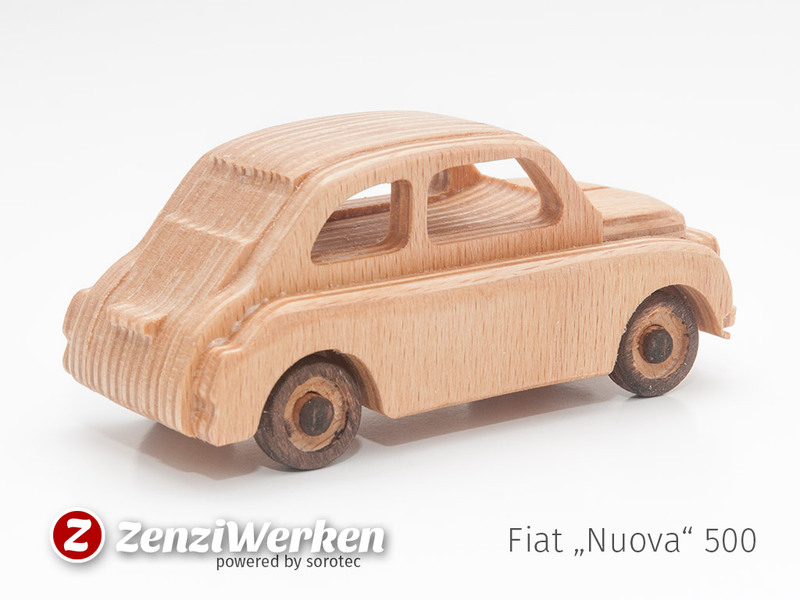 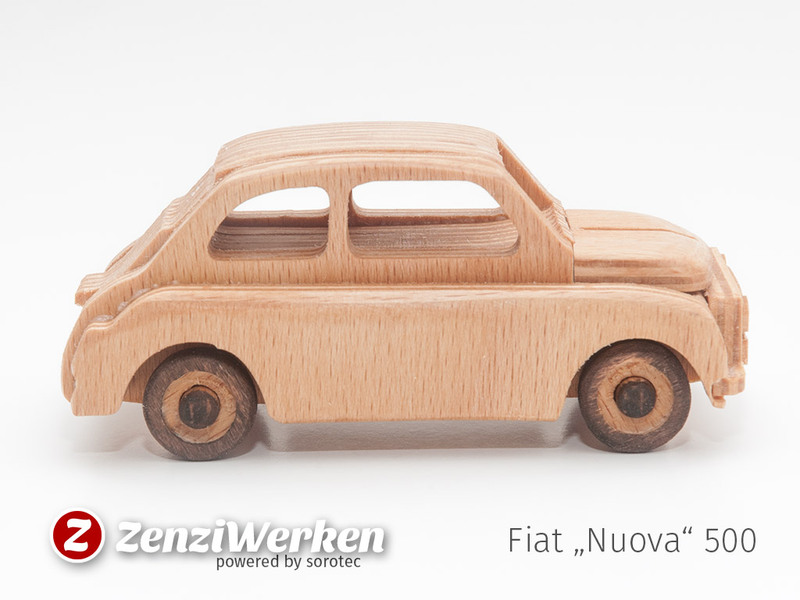 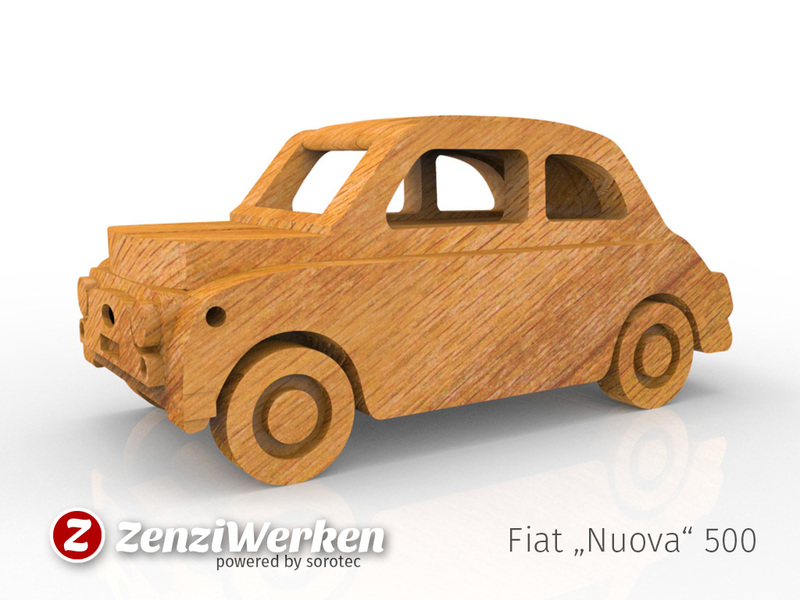 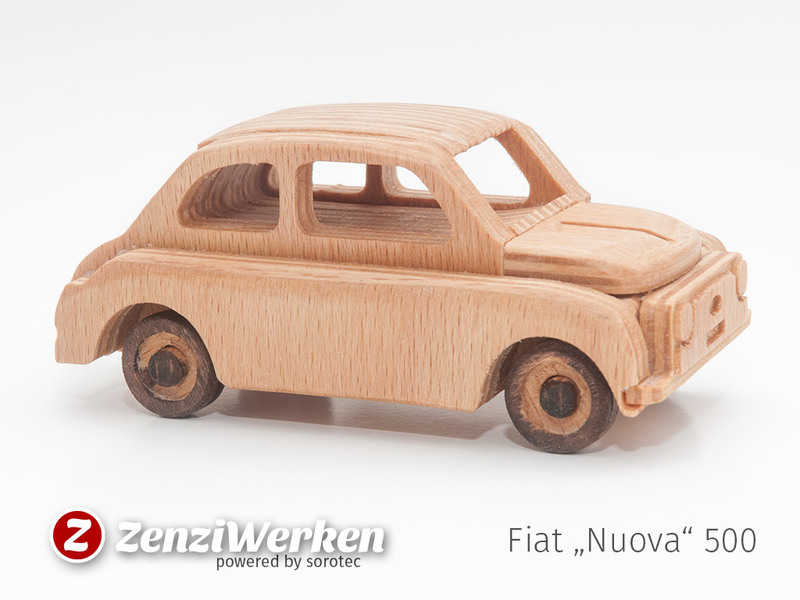 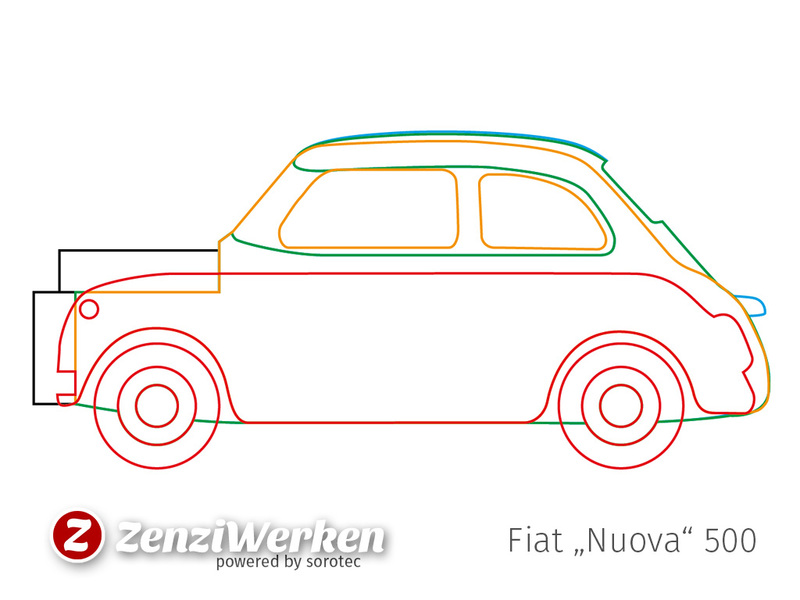 The Fiat Nuova Cinquecento (500) was built from 1957 through 1975. 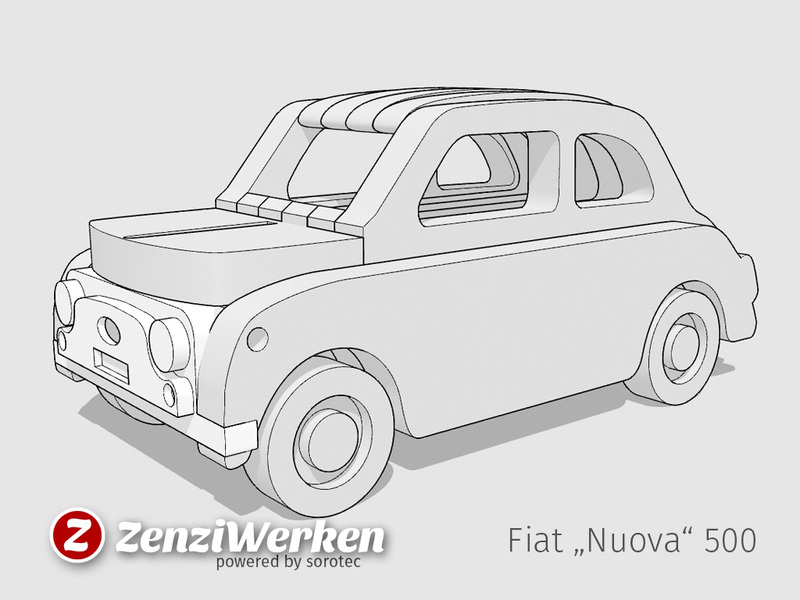 The 500 derives from the cubic capacity and the first version had 13,5 horsepower which propelled the vehicle to a maximum speed of a blazing 50 miles per hour. 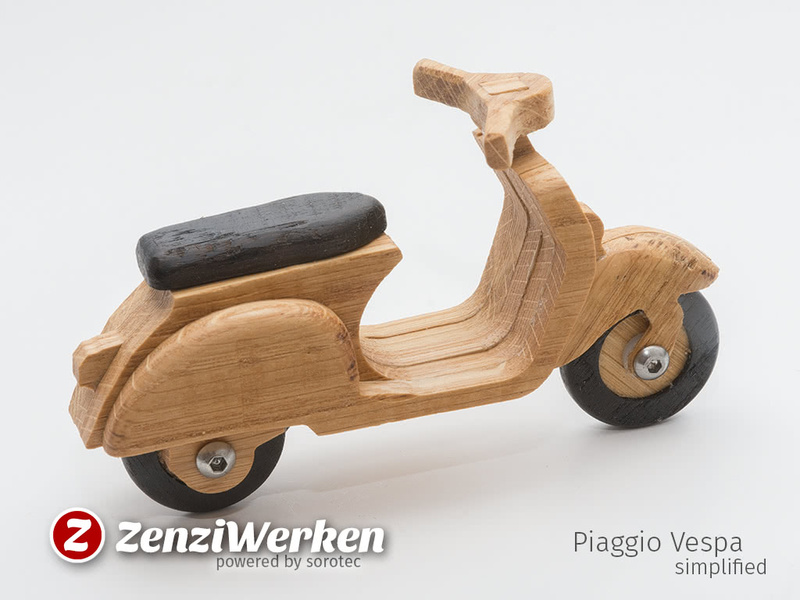 Probably easy fast enough for a traffic jam in Rome. 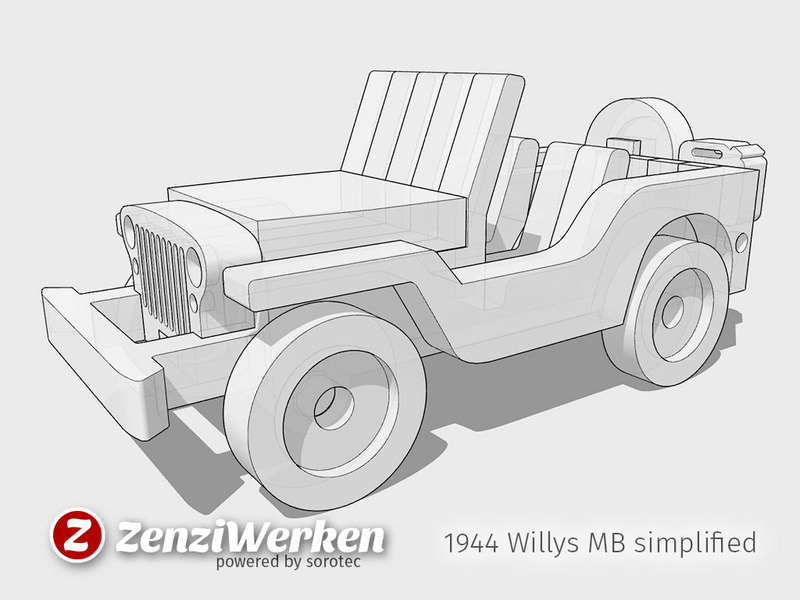 After my model of the Willys MB I wanted to make another cabriolet to make use of plexiglass for the windshield. 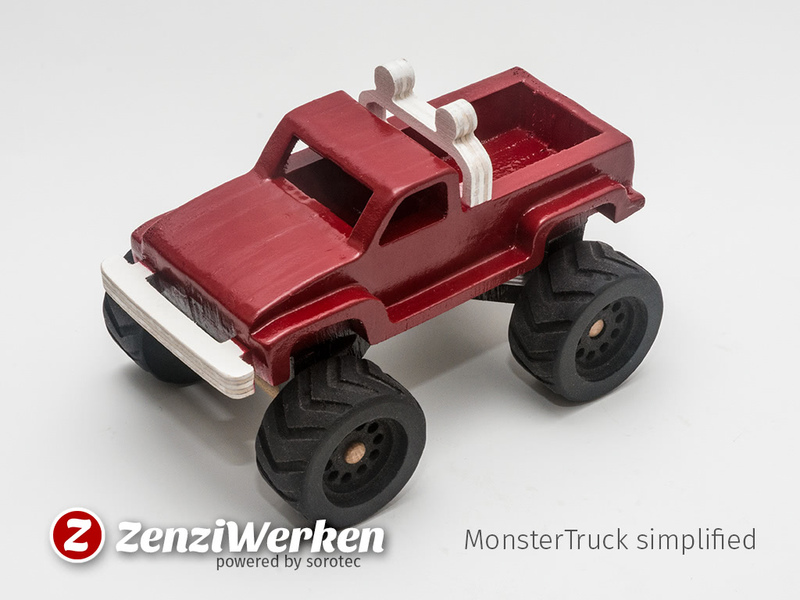 I used a dark colored material, which gives this model a very cool look. 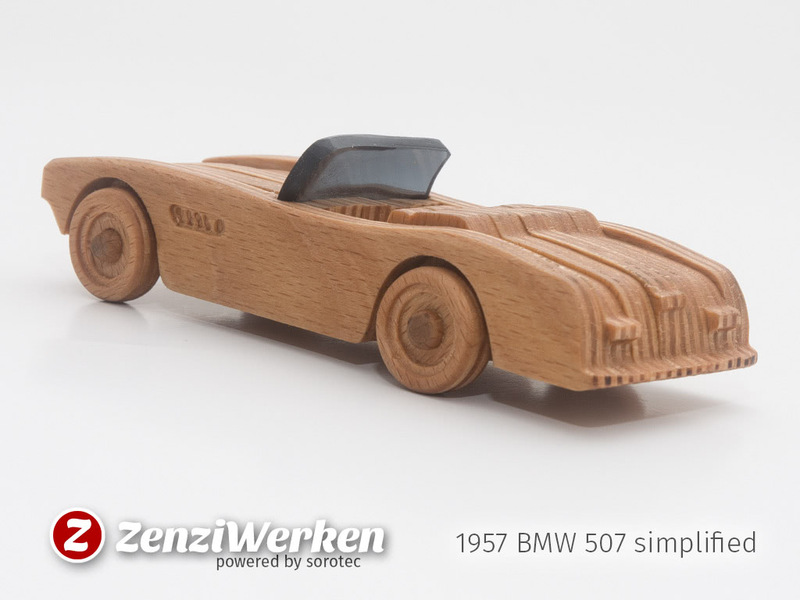 As I come from Bavaria myself a BMW was an obvious choice. 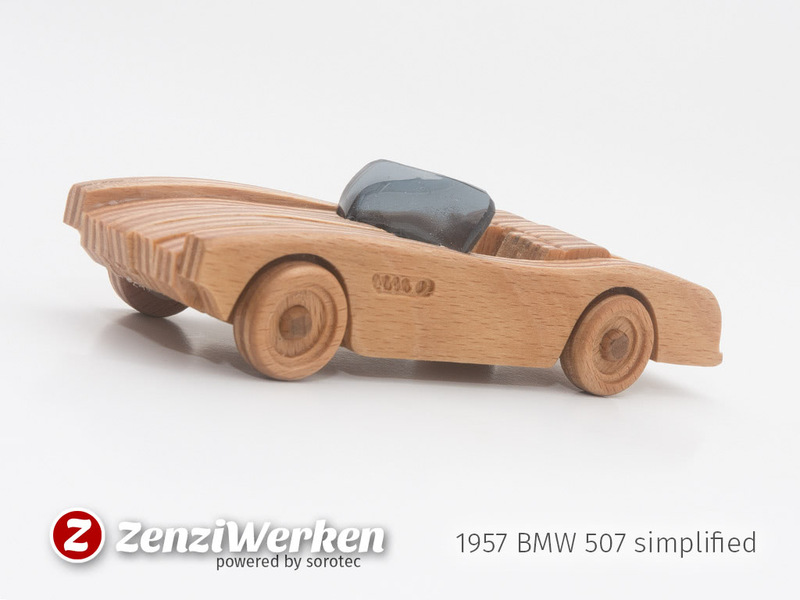 The 507 is not one of the most familiar models, but sure Elvis fans will know that their idol drove one of these babies once. 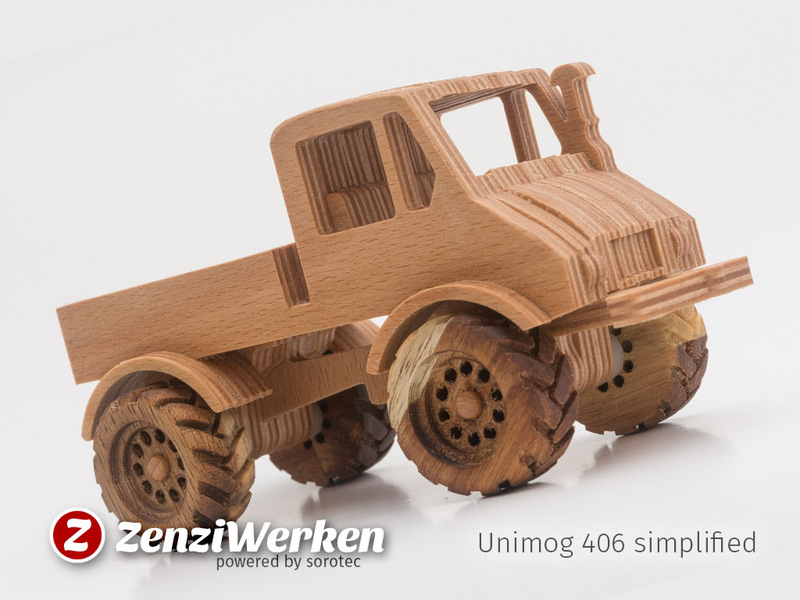 Looking for another model to feature my super-cool rotary engraved tires I came across the classic Mercedes Benz Unimog. 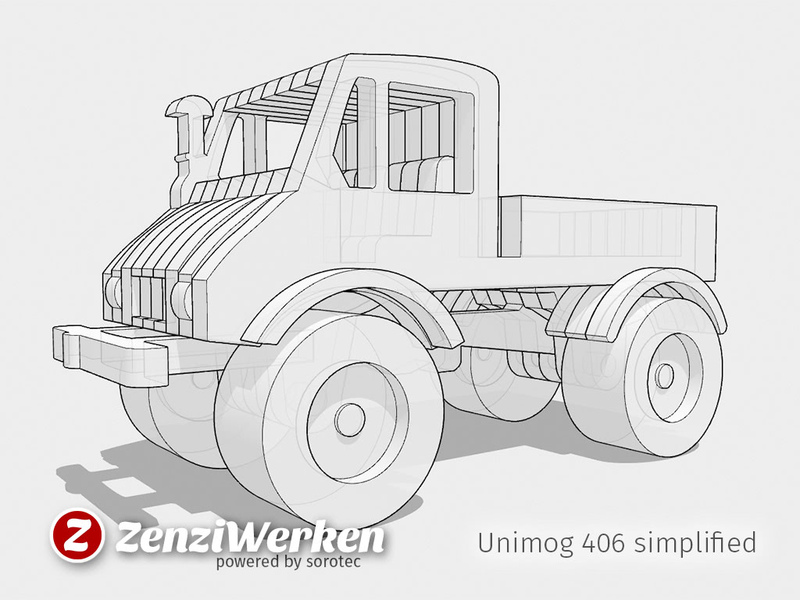 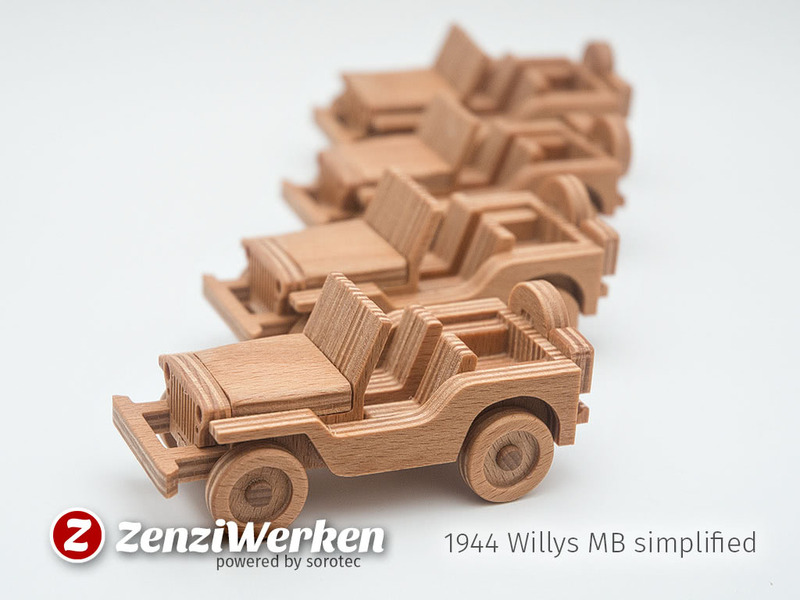 The multi-purpose 4x4 truck was developed in 1945 and the 406-series started in 1963. 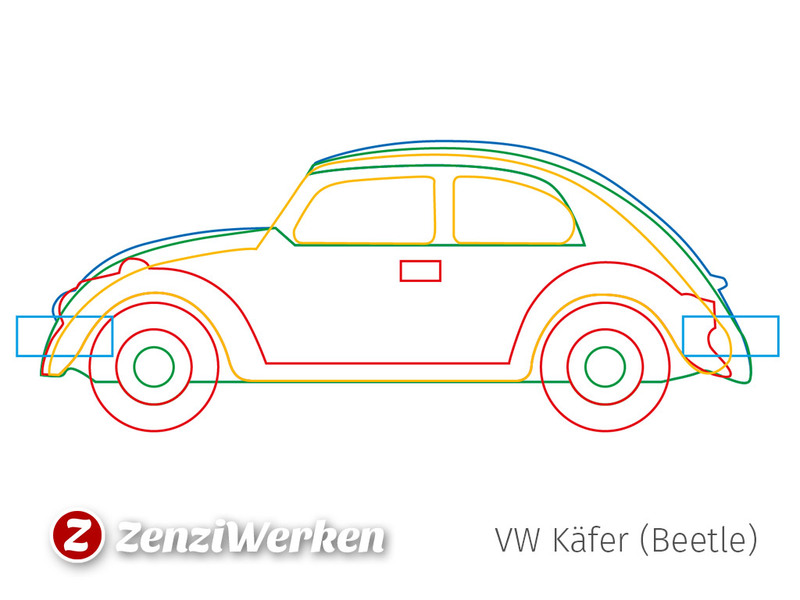 The name is an abbreviation of Universal-Motor-Gerät. 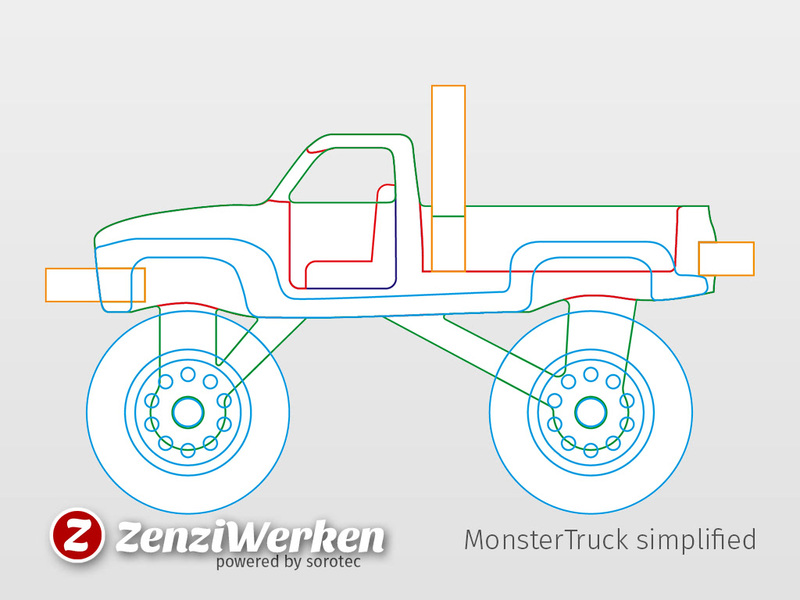 It's a beast. 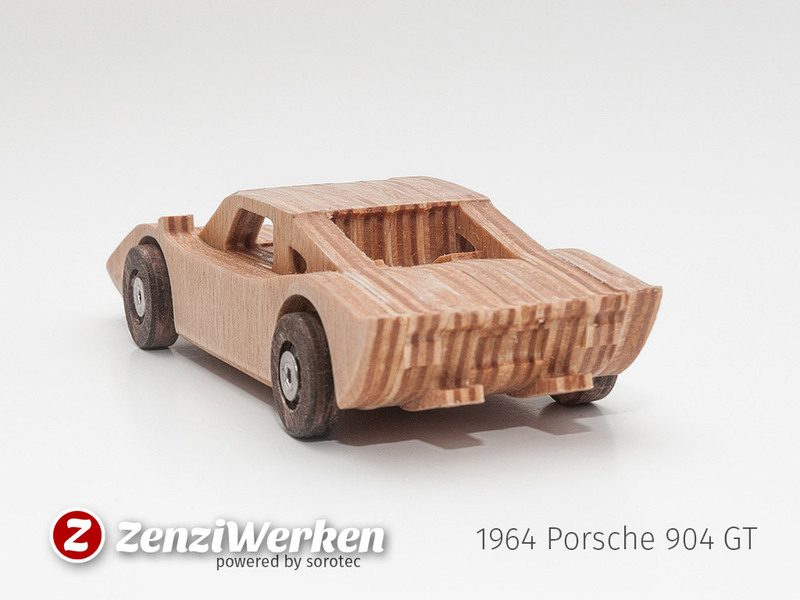 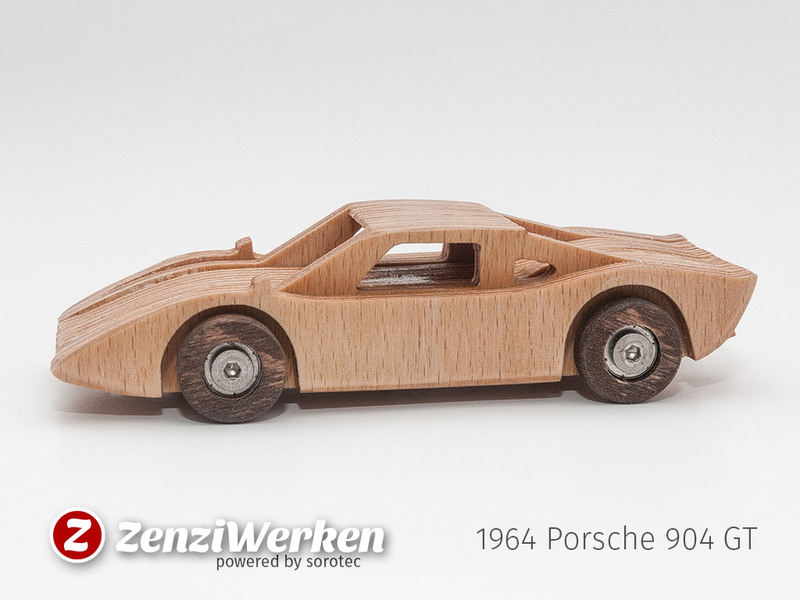 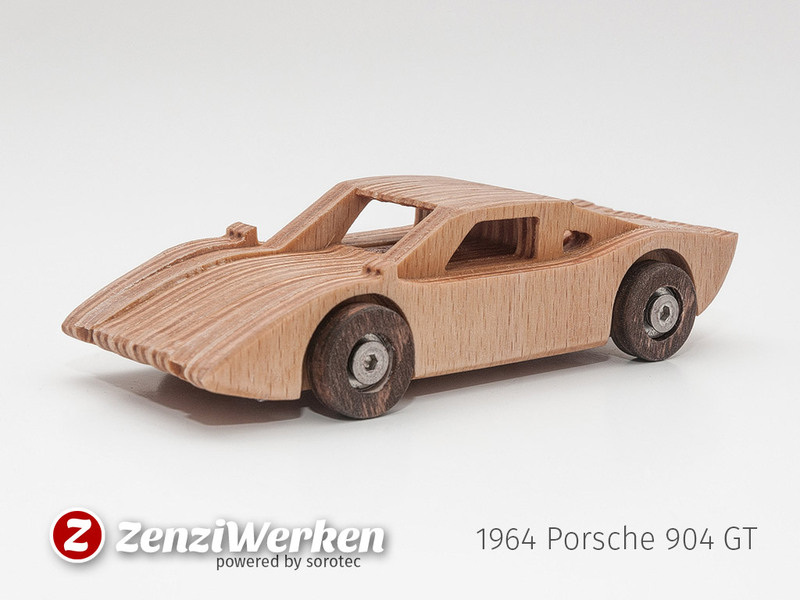 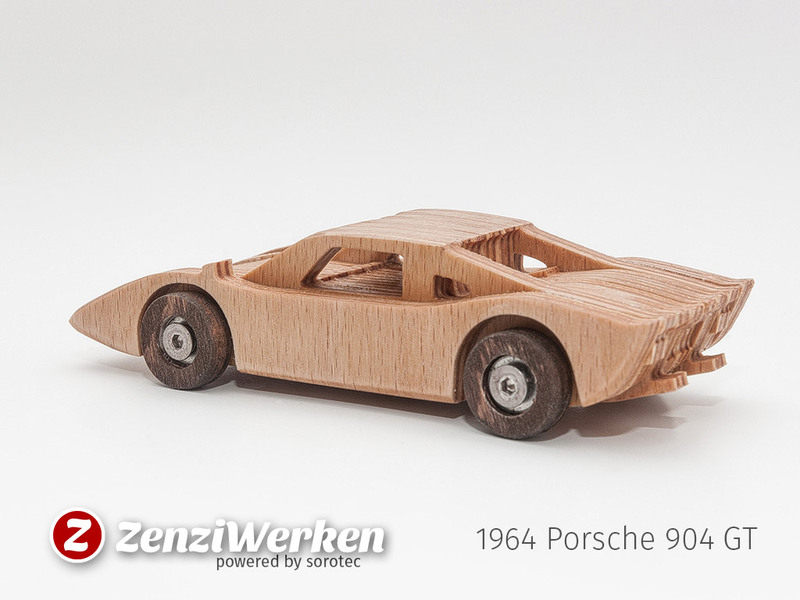 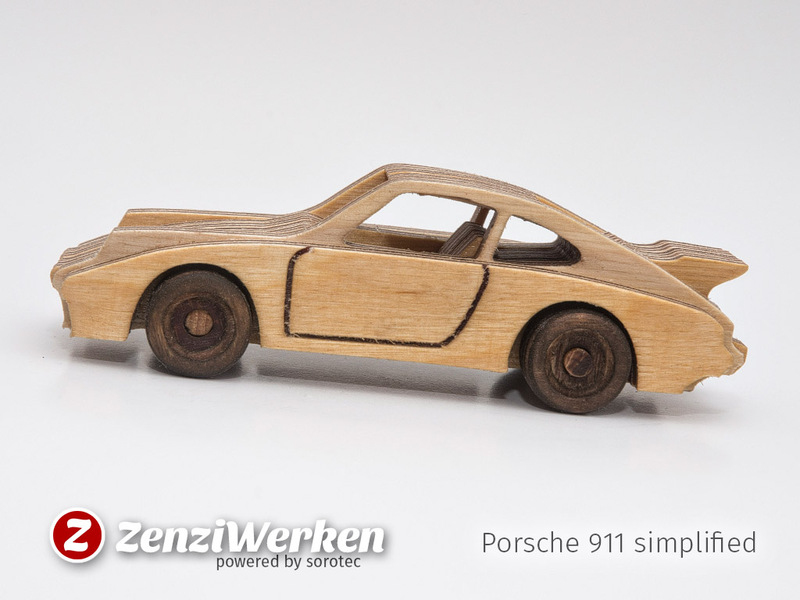 No more words needed for a 1964 Porsche 904 GT! 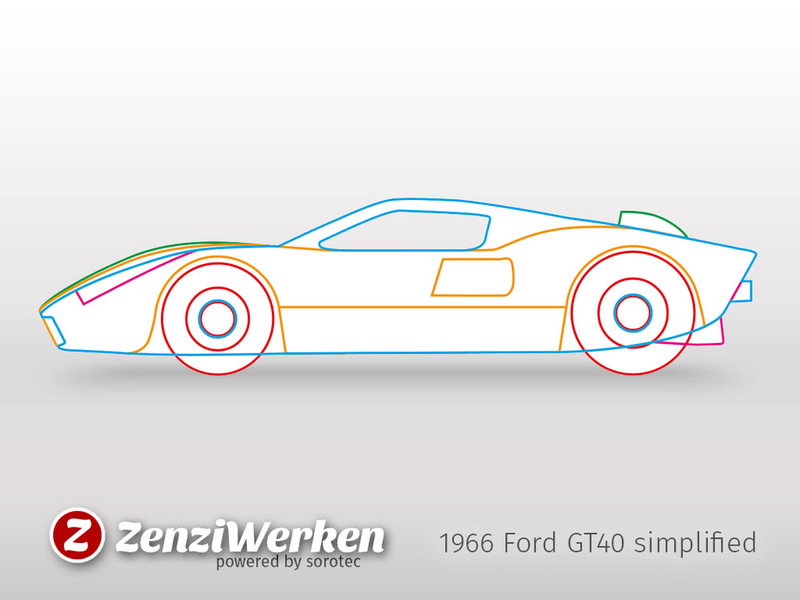 The Ford GT40 Mk2 (GT stands for Gran Tourismo) did win the "24 Hours of Le Mans" four times in a row. 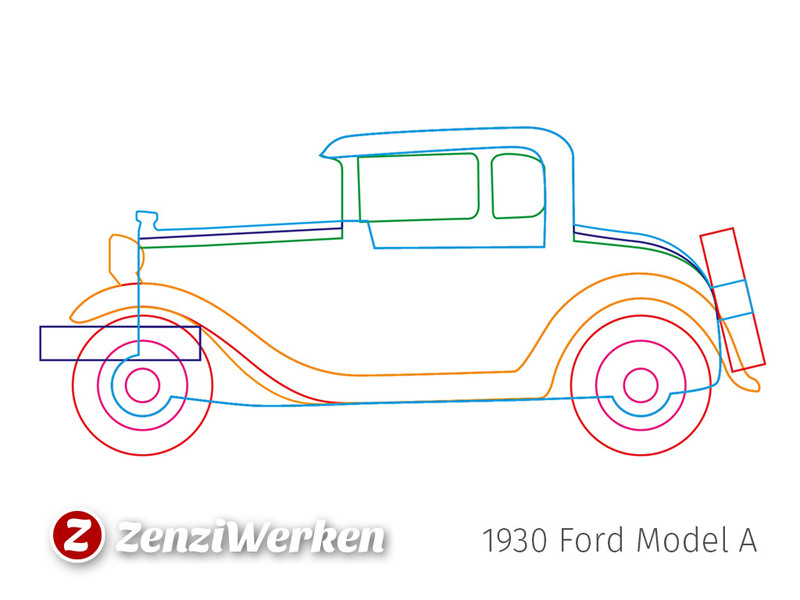 The original reason for the development was kind of a revenge of Henry Ford II on Enzo Ferrari for breaking up the negotiations for the sale of Ferrari to Ford. 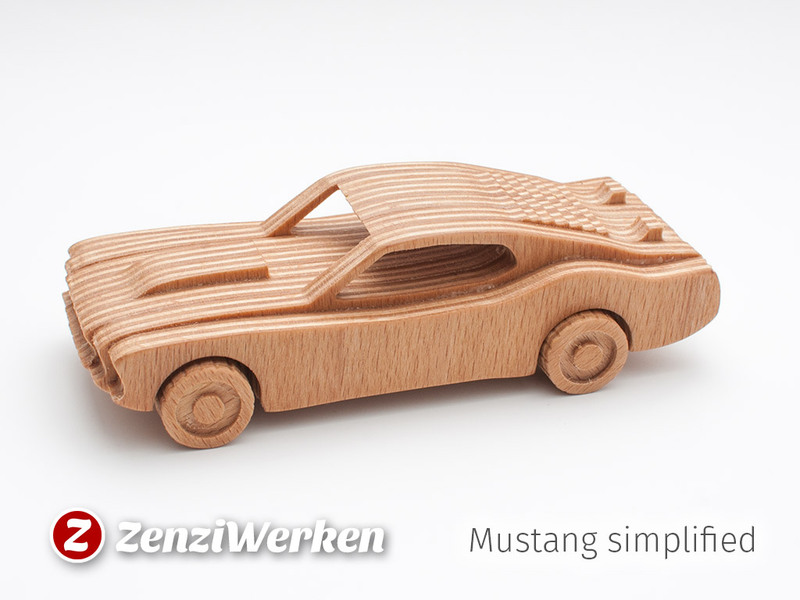 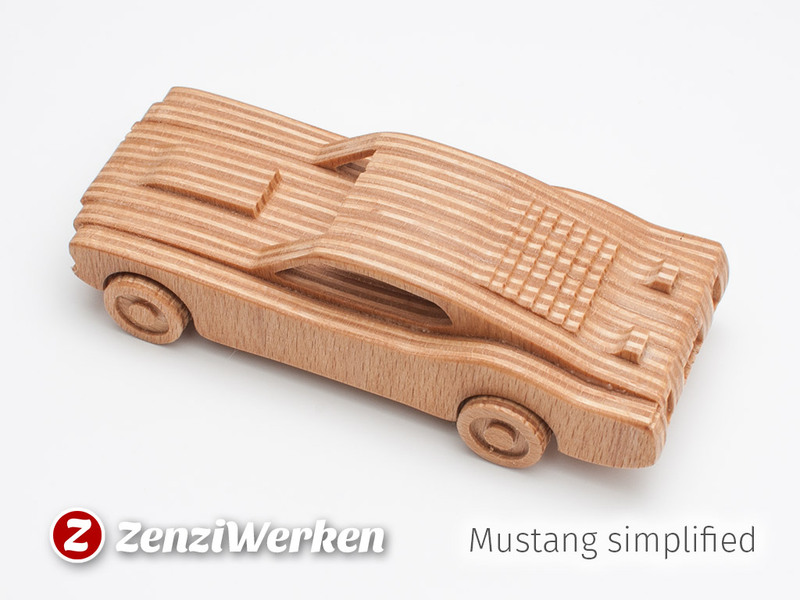 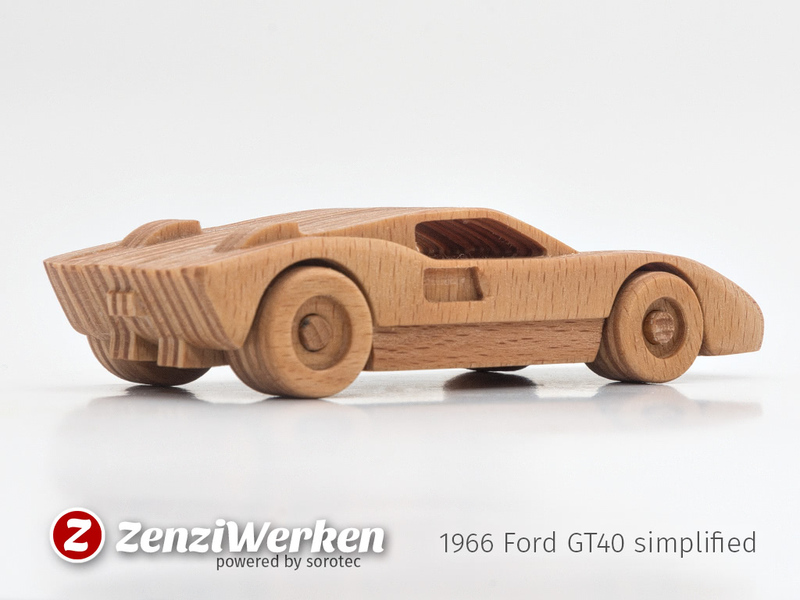 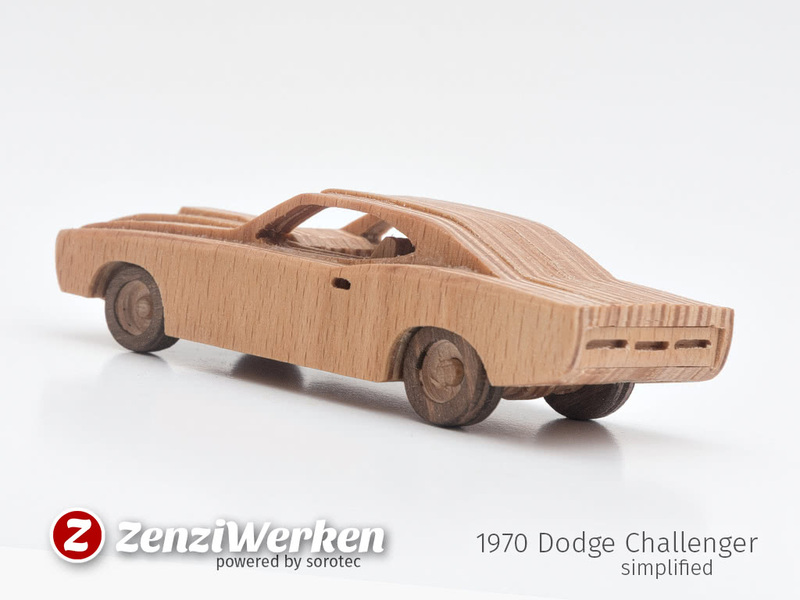 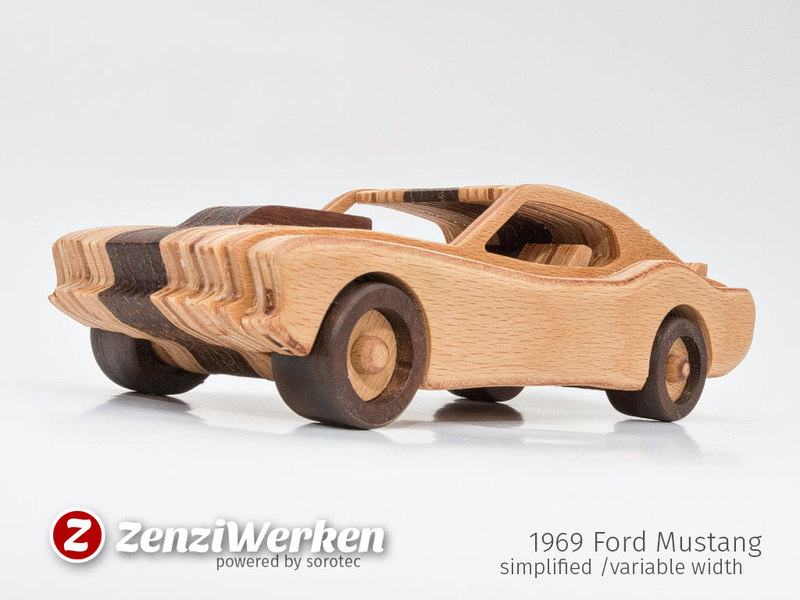 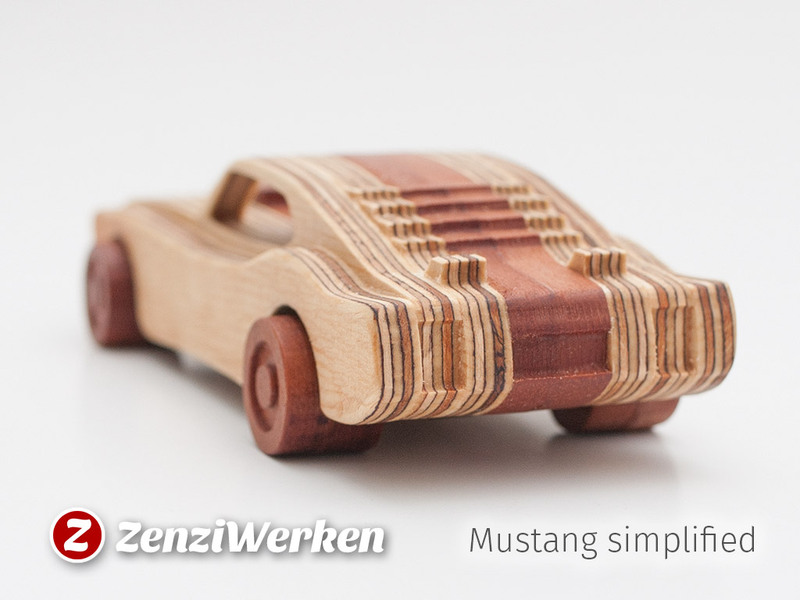 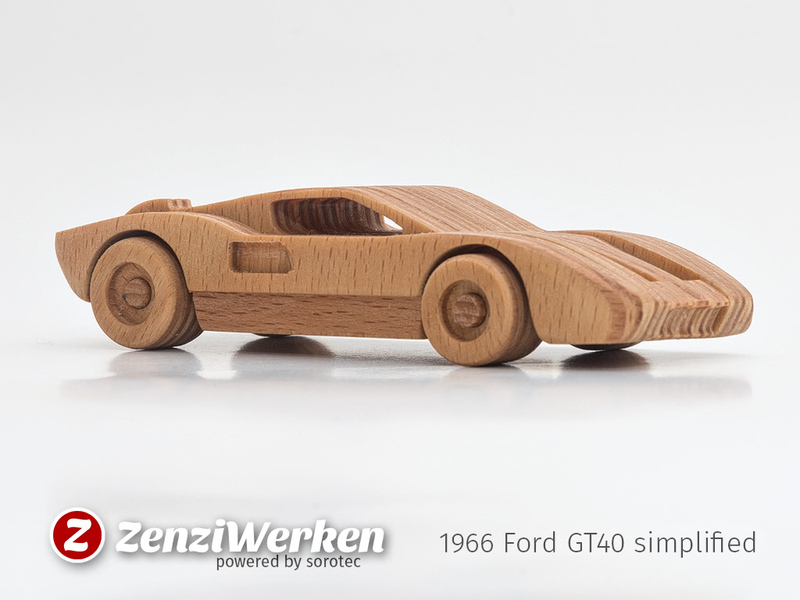 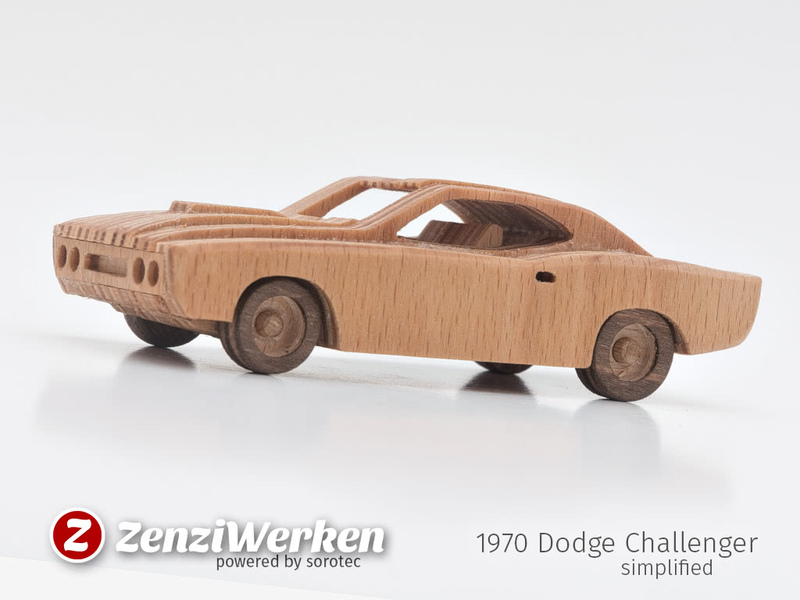 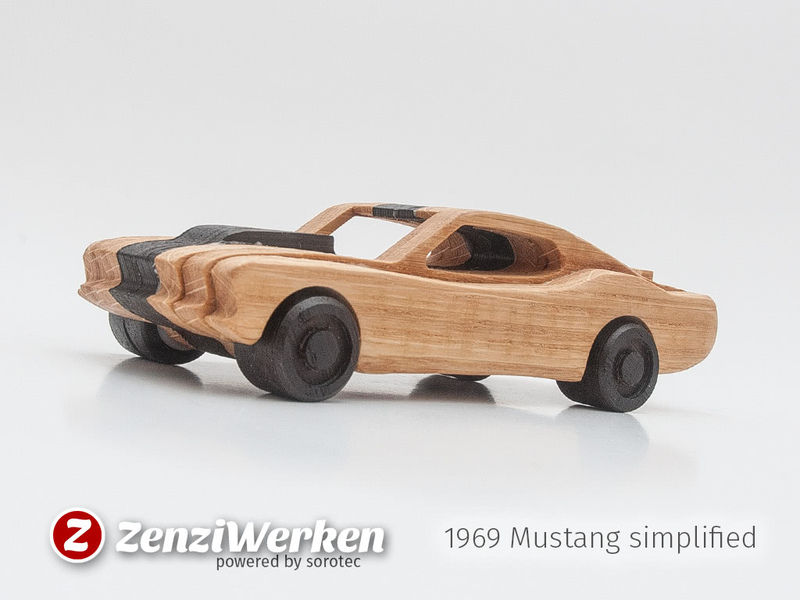 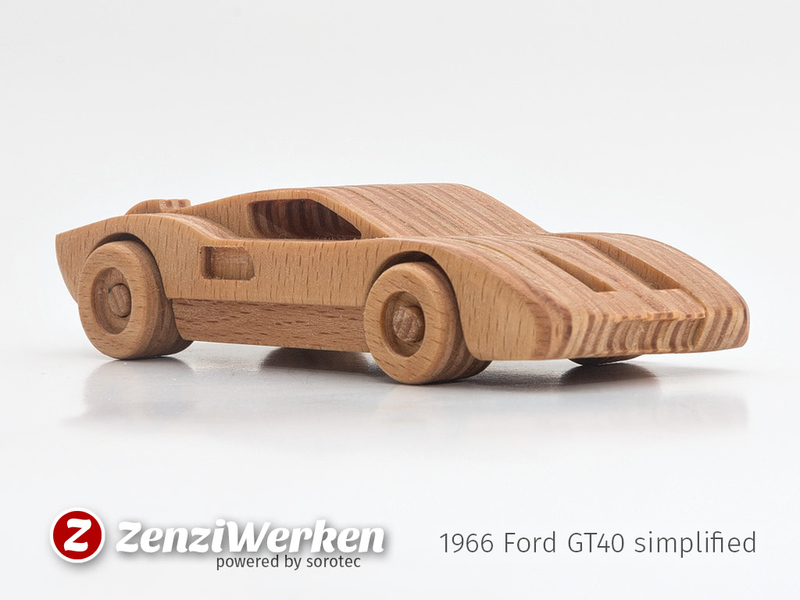 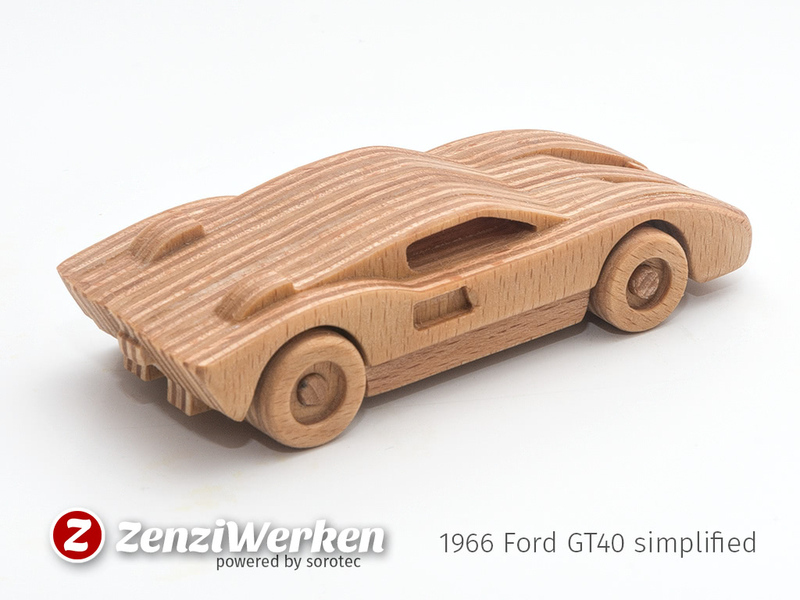 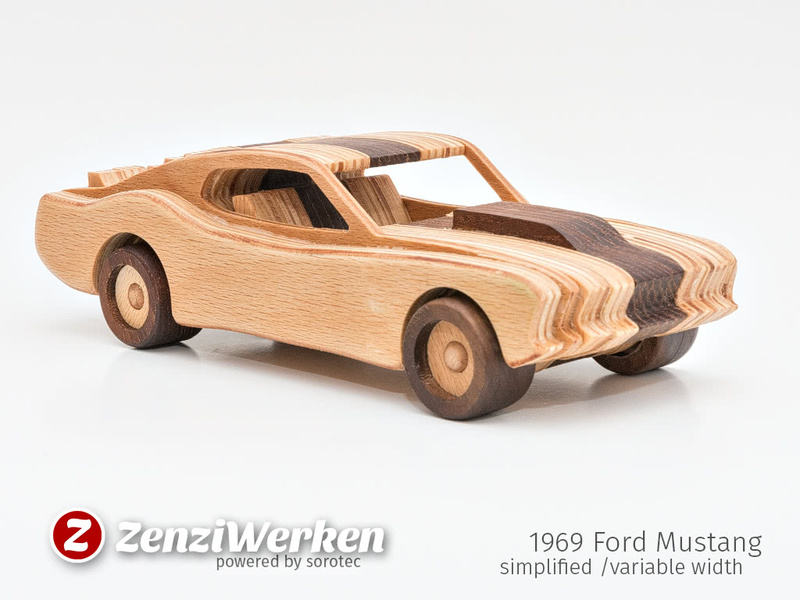 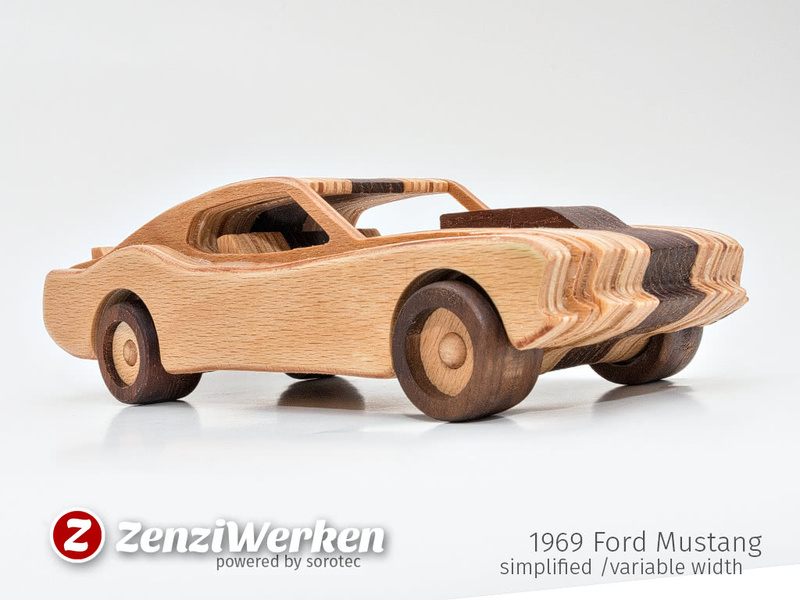 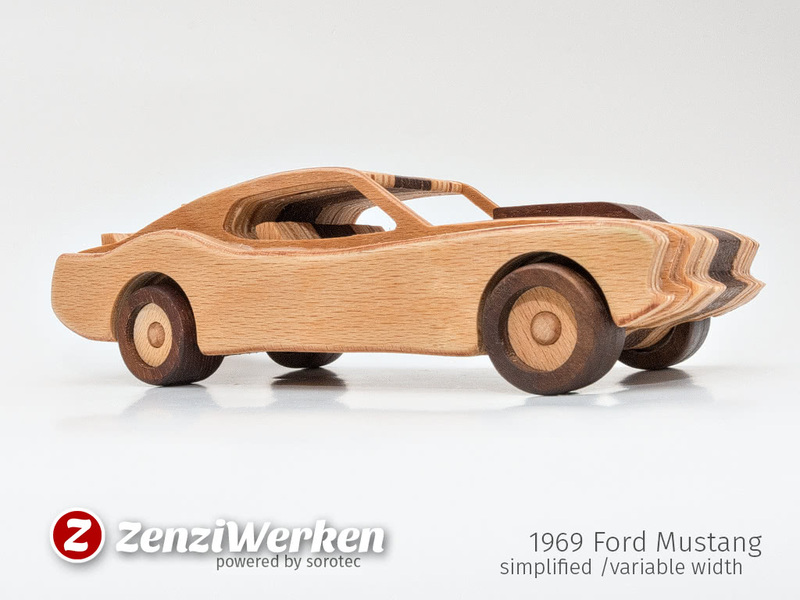 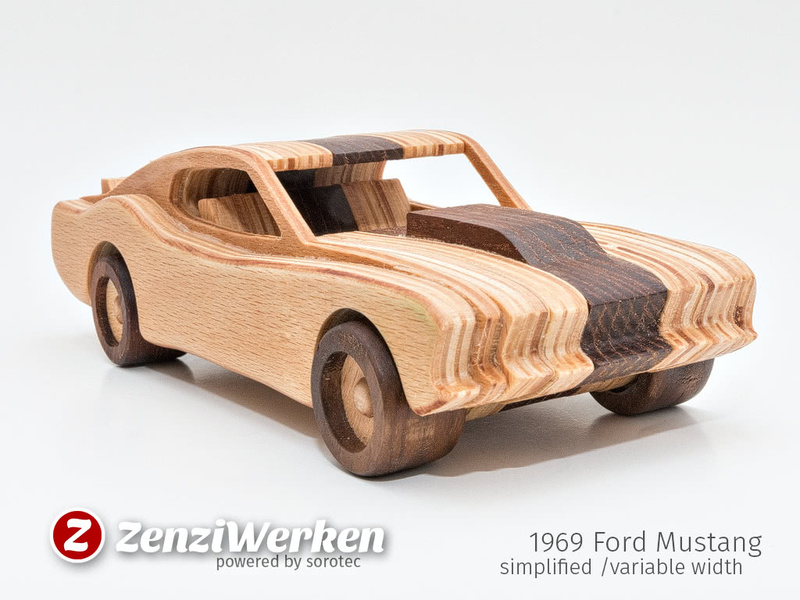 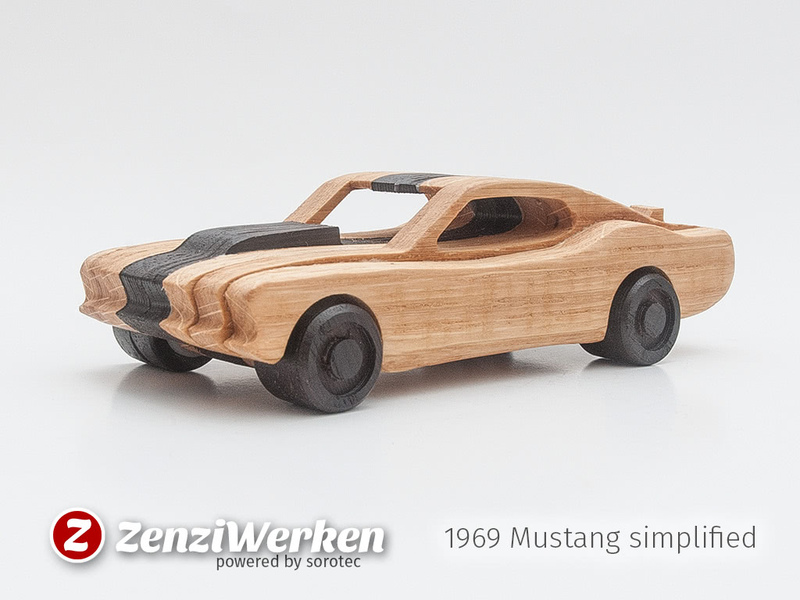 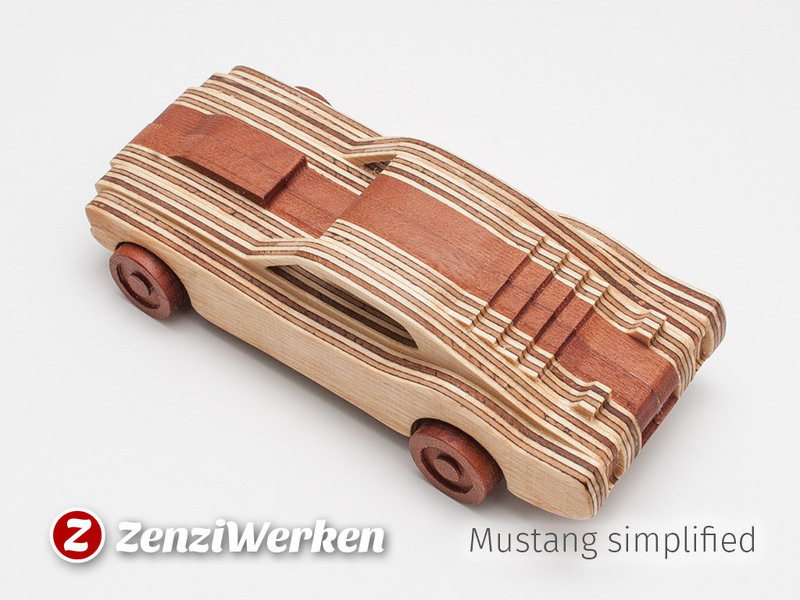 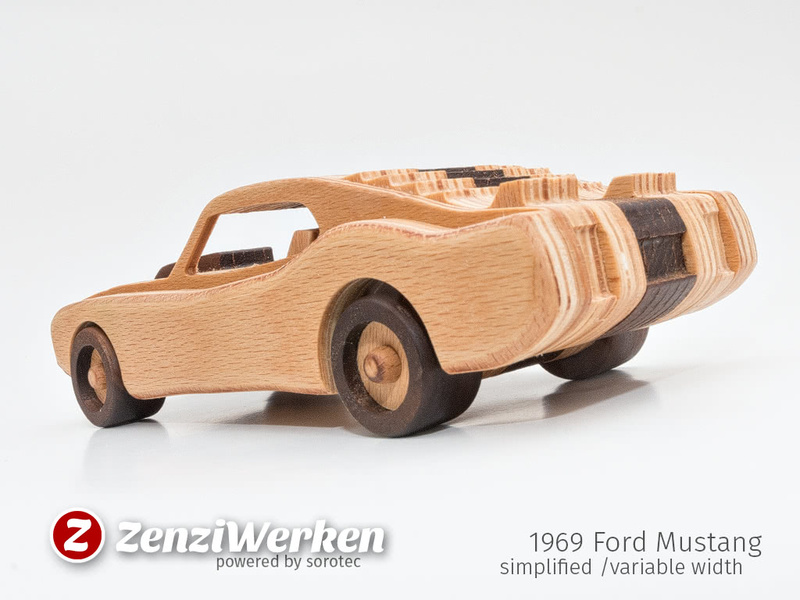 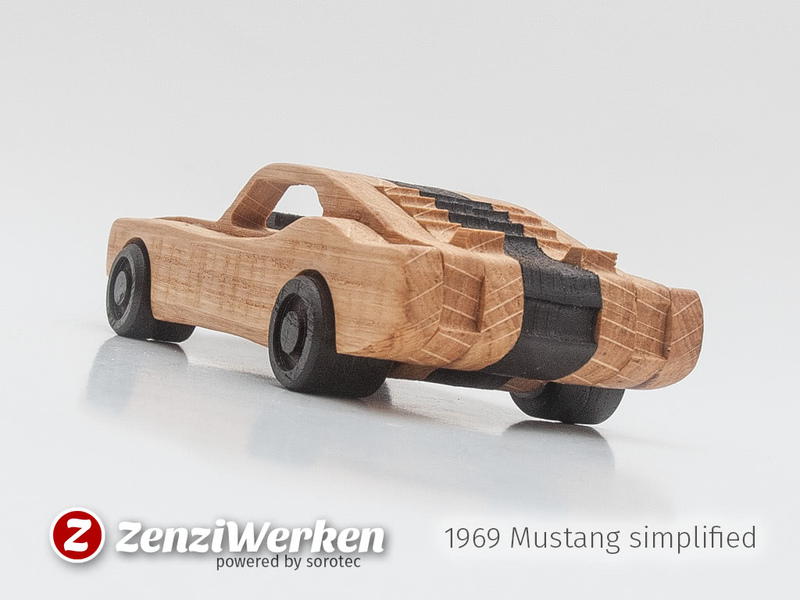 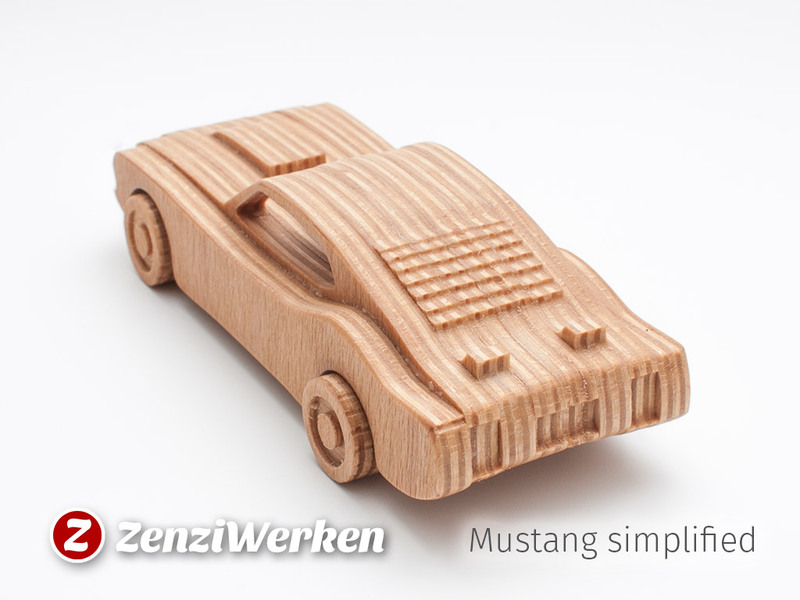 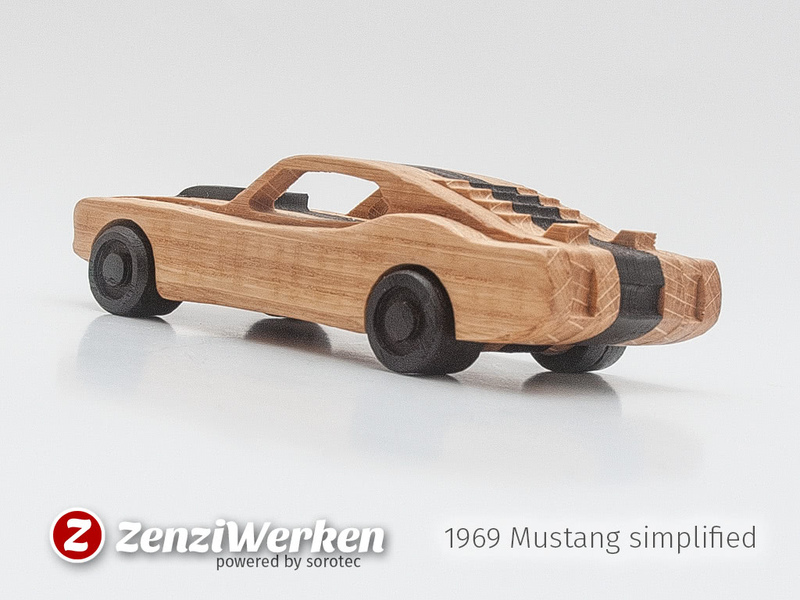 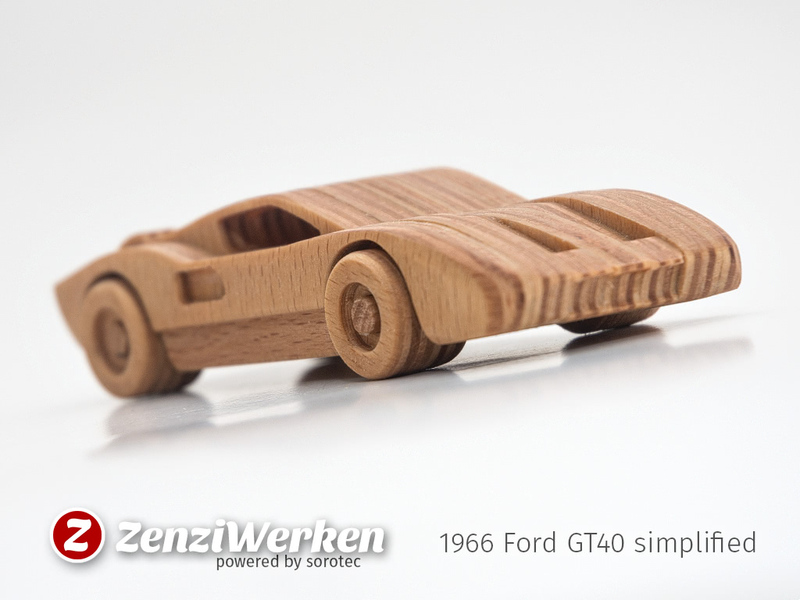 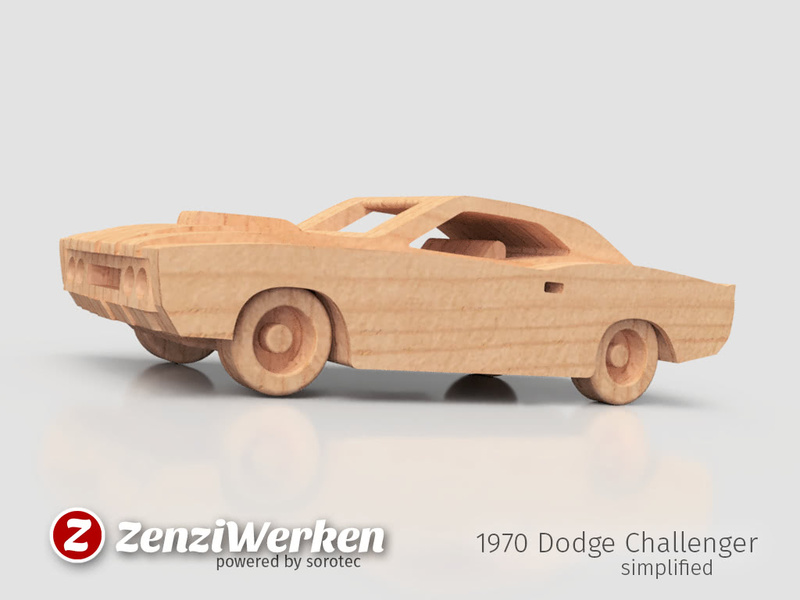 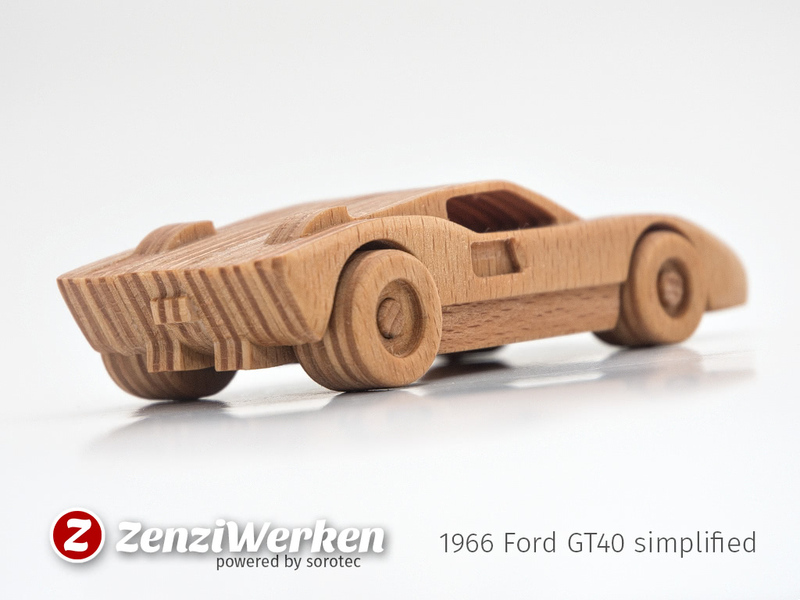 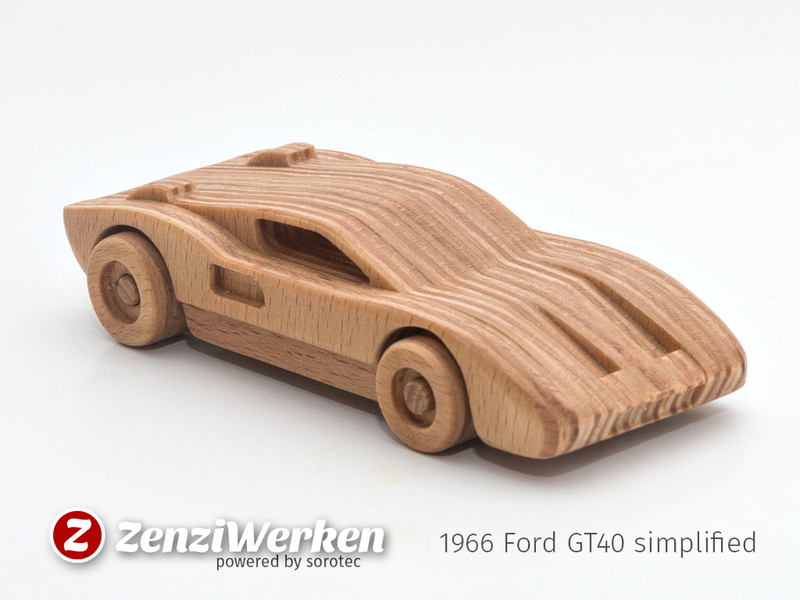 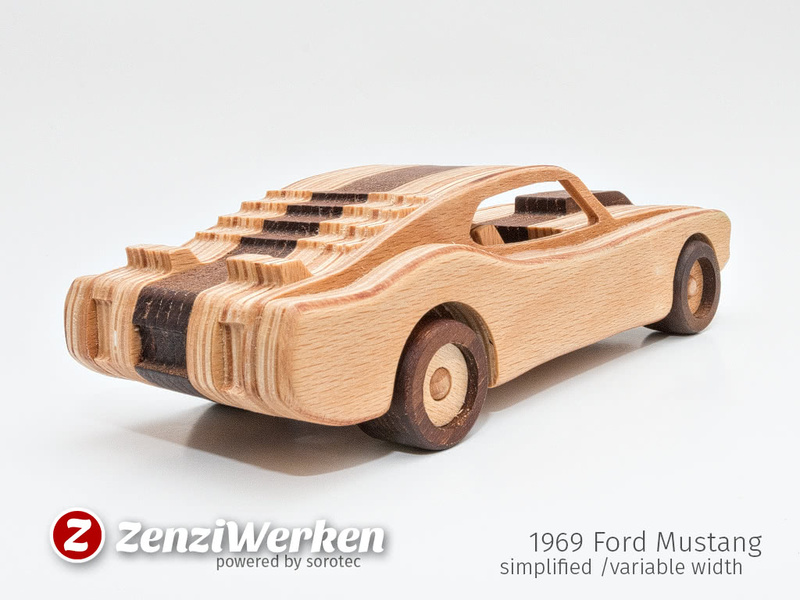 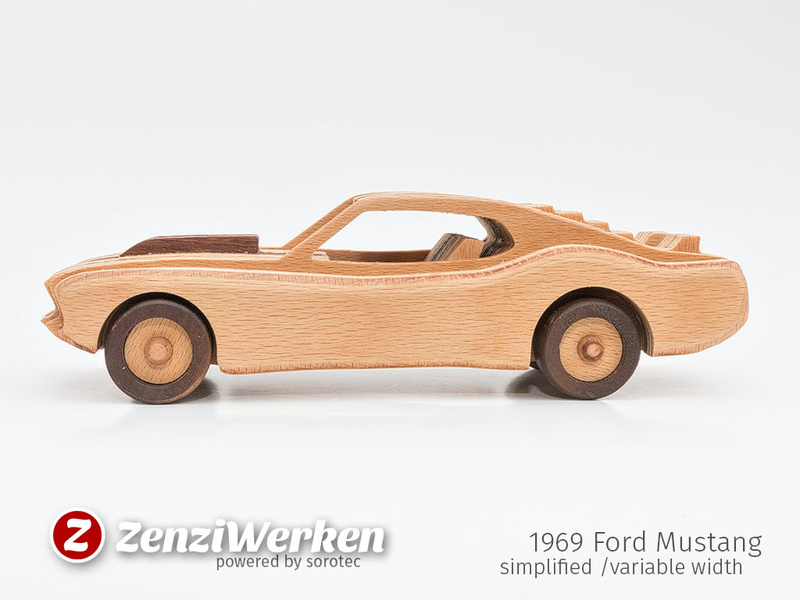 My first simplified car model was the 1969 Ford Mustang. 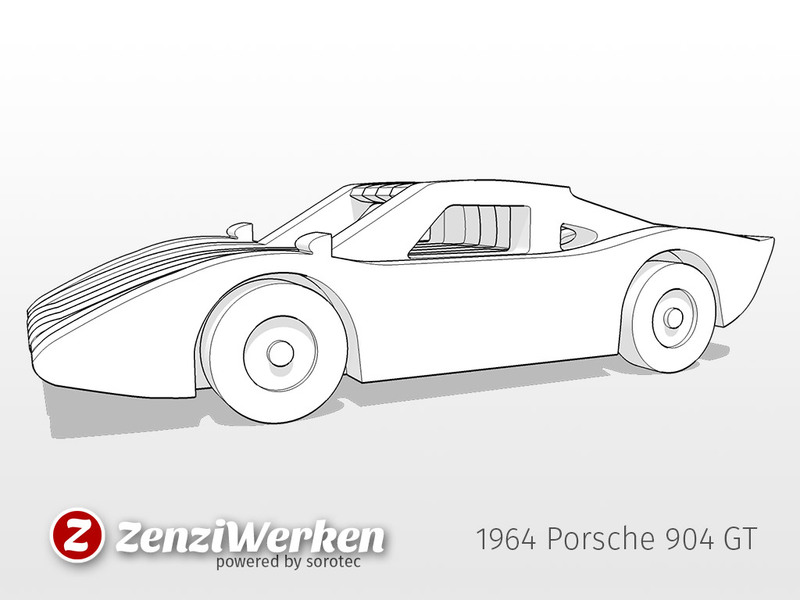 It still is one of the most downloaded things I published. 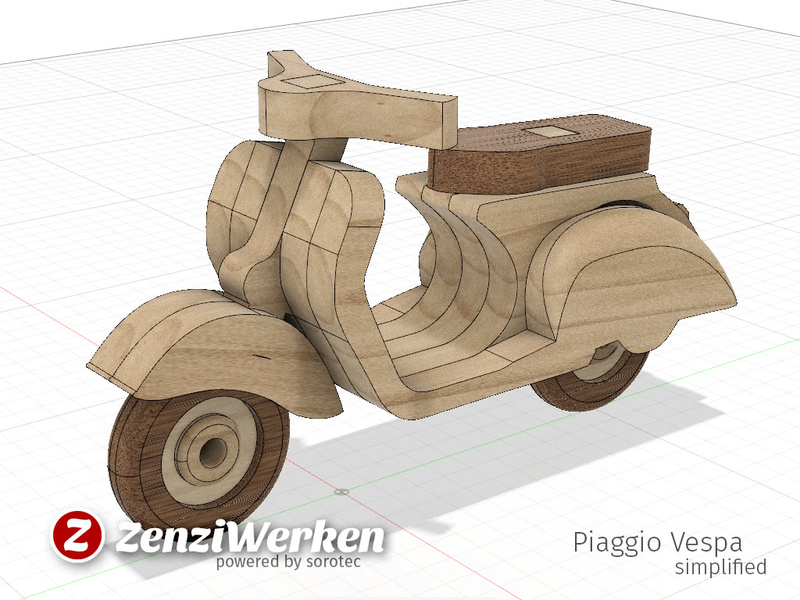 In the course of a attendance at a maker fair I revisited the model and upgraded it to use layers of various width. 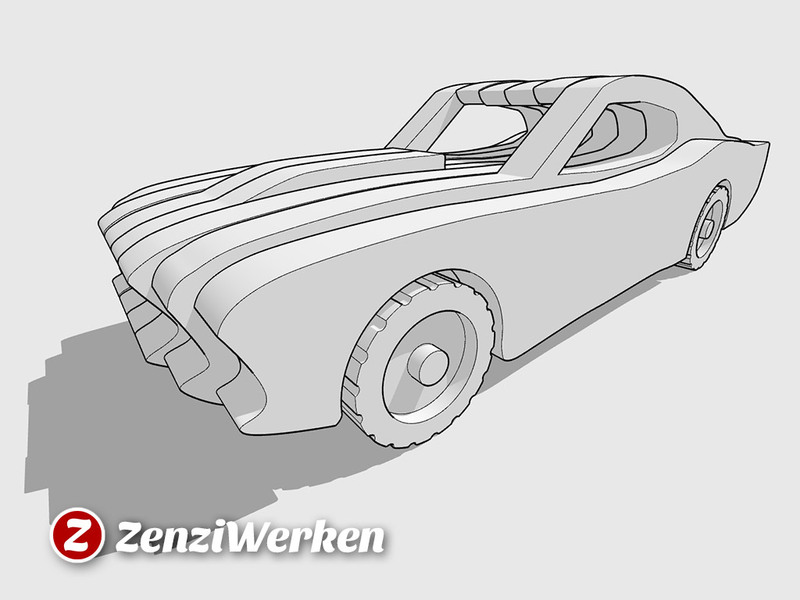 As I wanted to create a larger model for th fair I used 10 mm as the standard width, 18 mm for the colored core and 4 mm for the thin layers. 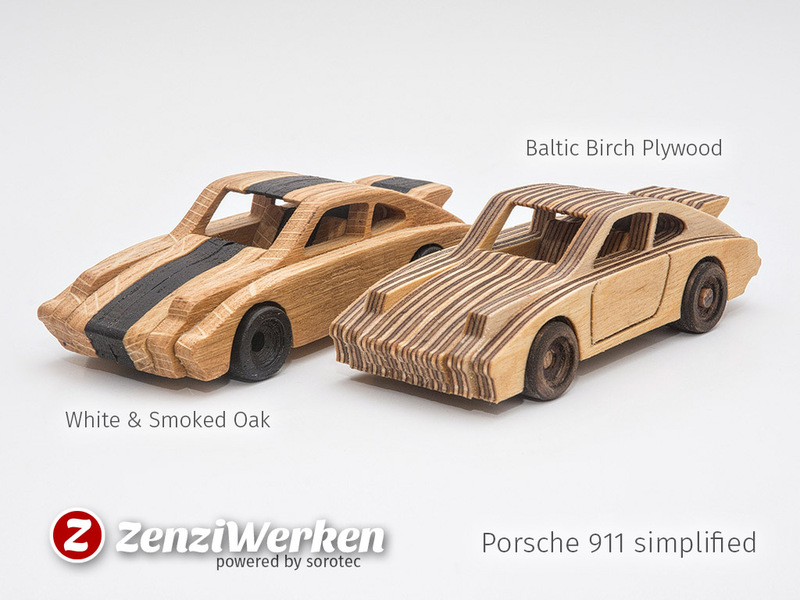 In order to create the impression of actual tires I used two different woods. 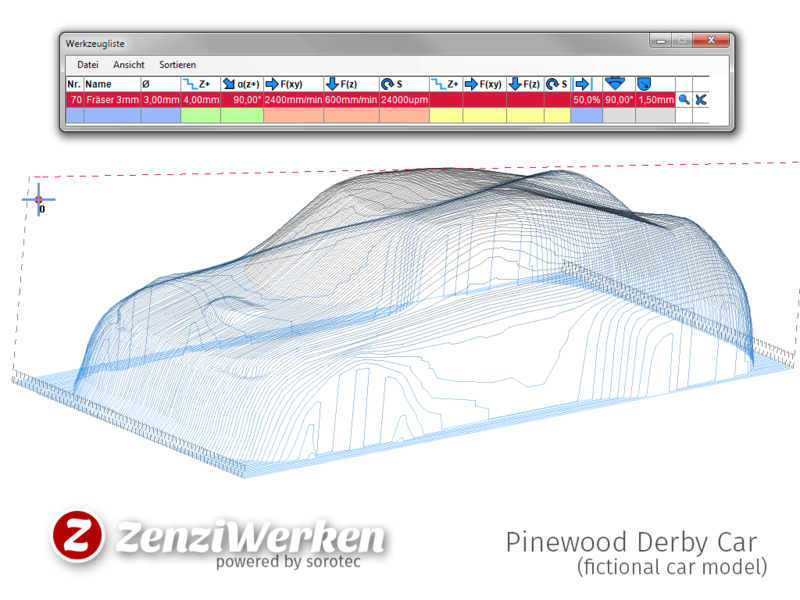 The new car interior with seats was another enhancement I adopted from other models I published. 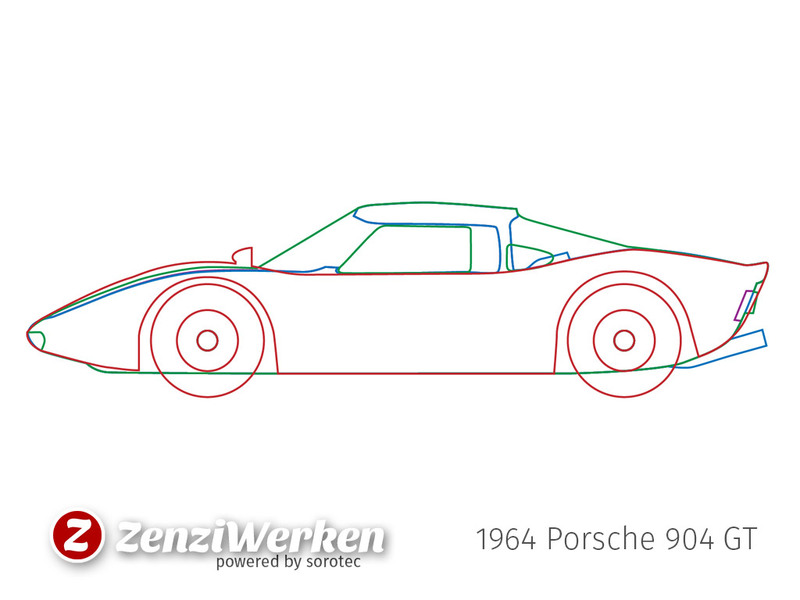 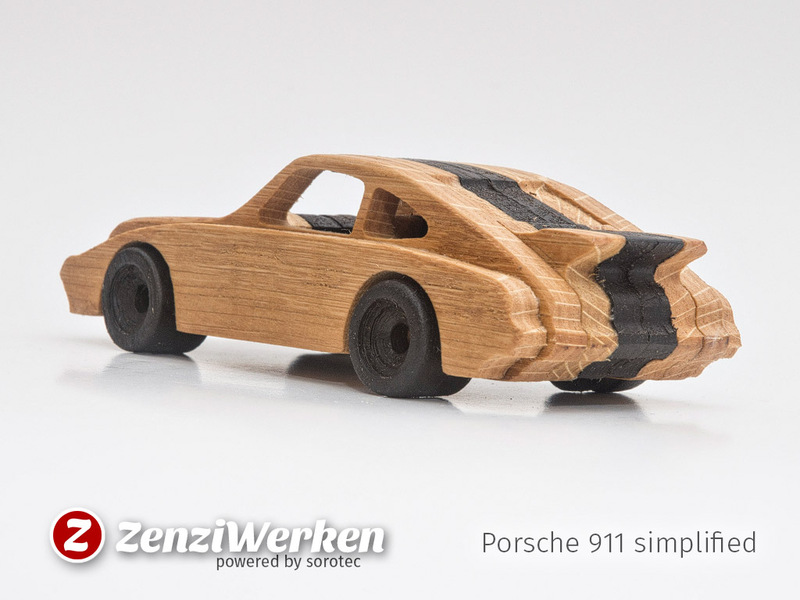 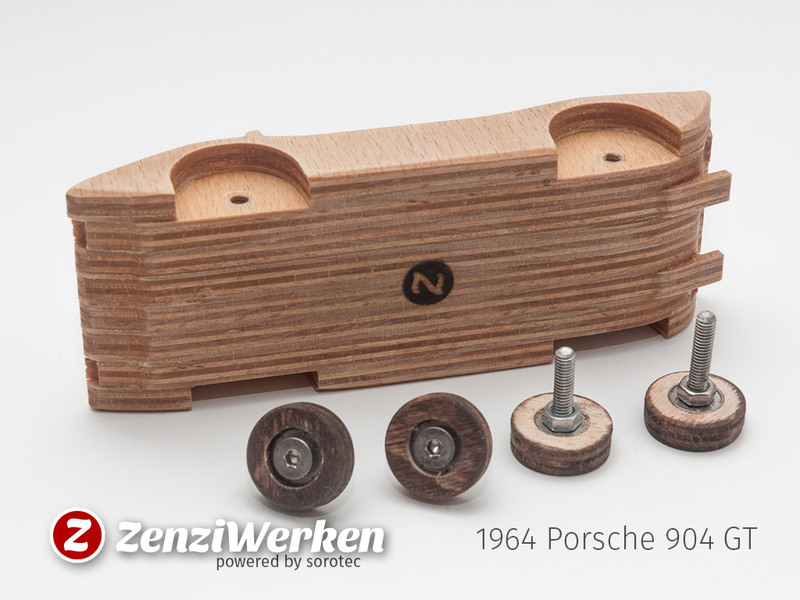 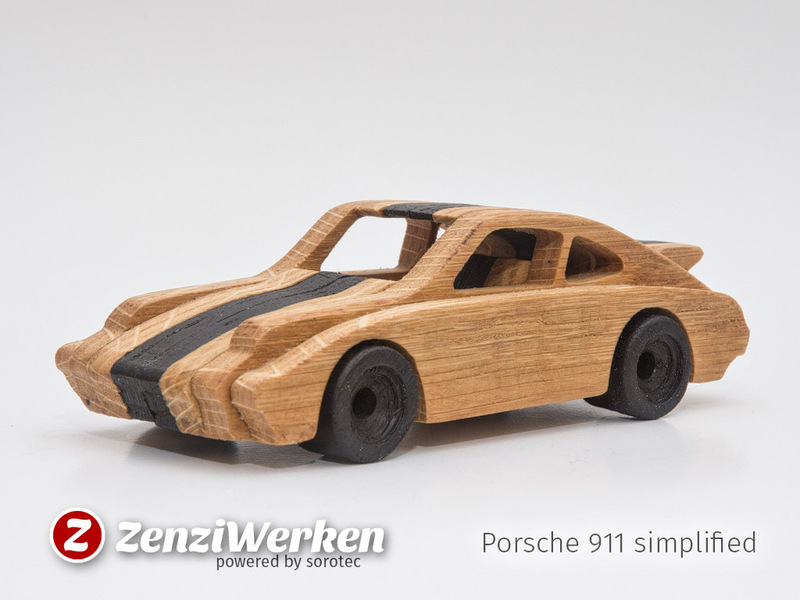 This is the car that stands for the German car manufacturer Porsche. 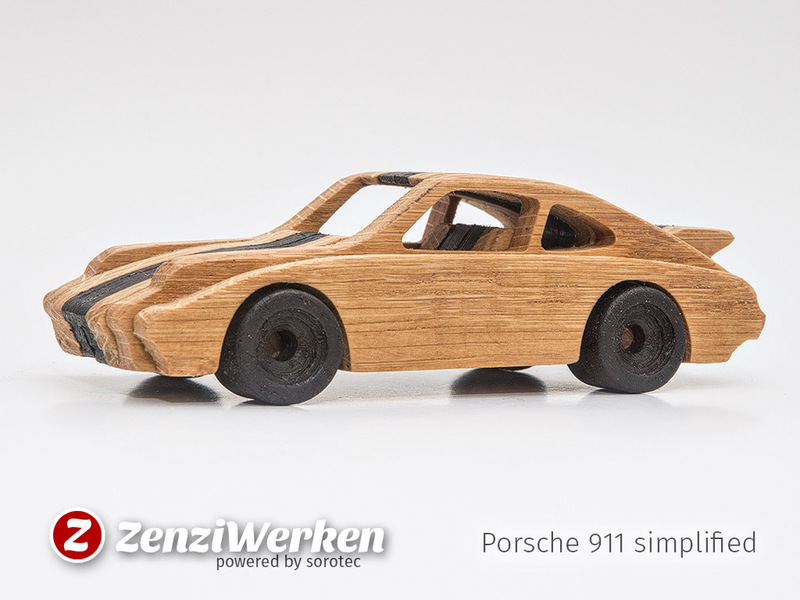 The nine-eleven or "Neun-Elfer" is the epitome of German "Ingenieurskunst" with a rear-mounted six-cylinder boxer engine and a legendary durability. 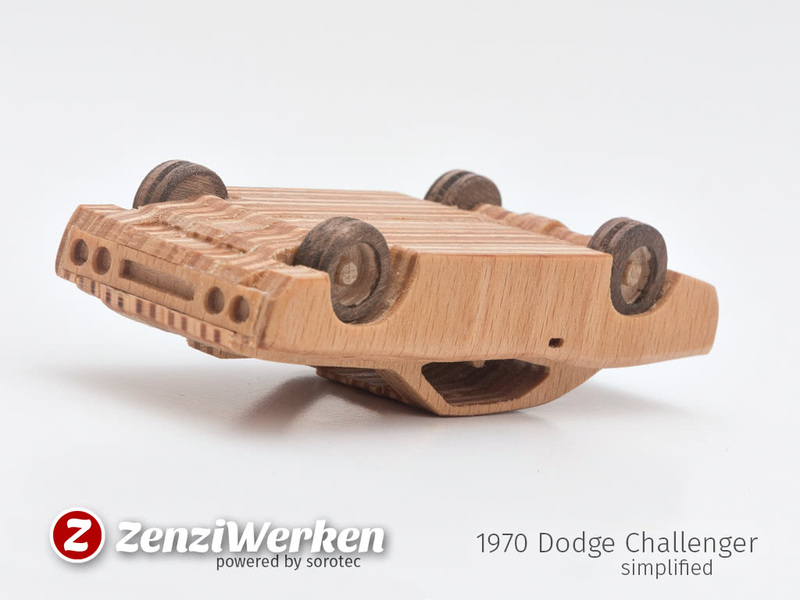 It made it on the 5th place of the Car of the Century. 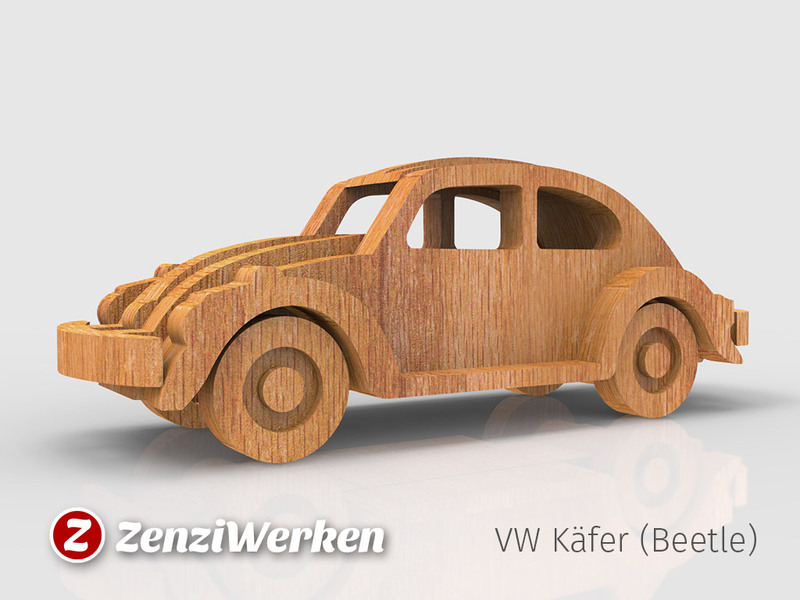 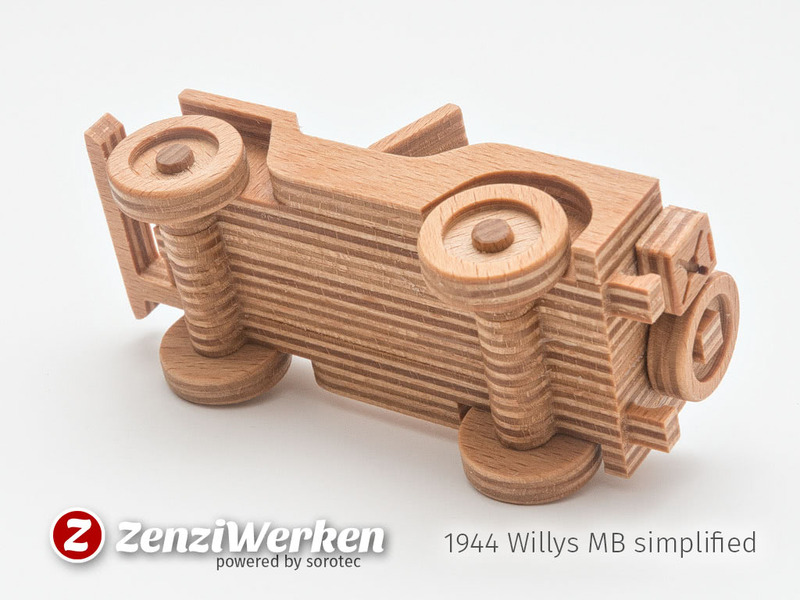 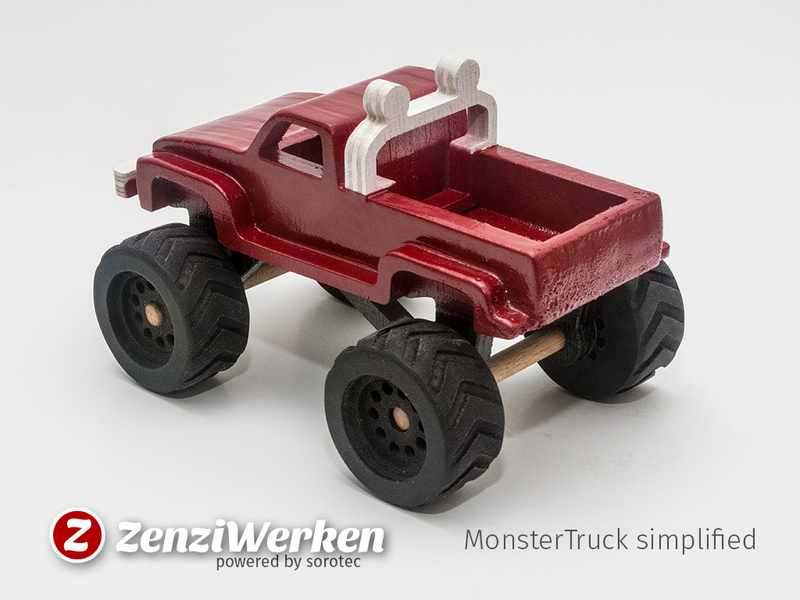  Download at Thingiverse built by Andys Werkstatt buy me a coffee commercial license? 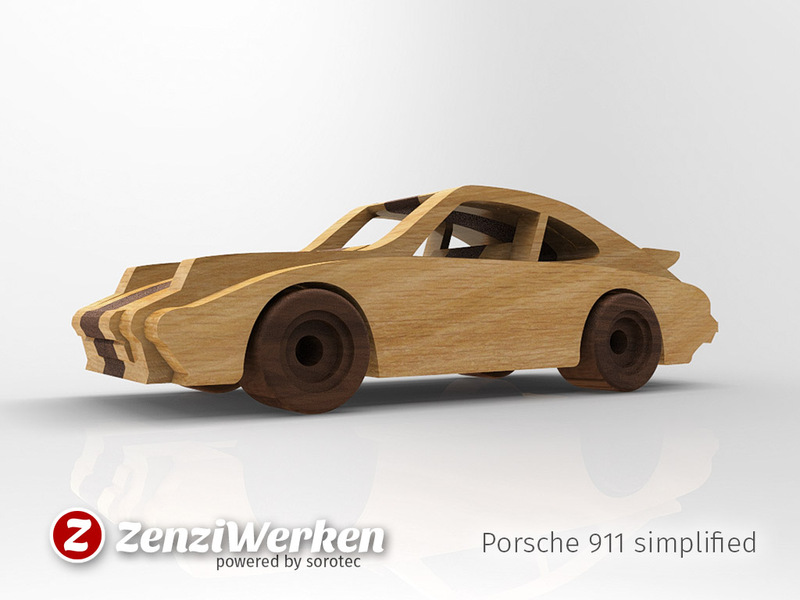 With all my models I have a maximum simplicity in mind. 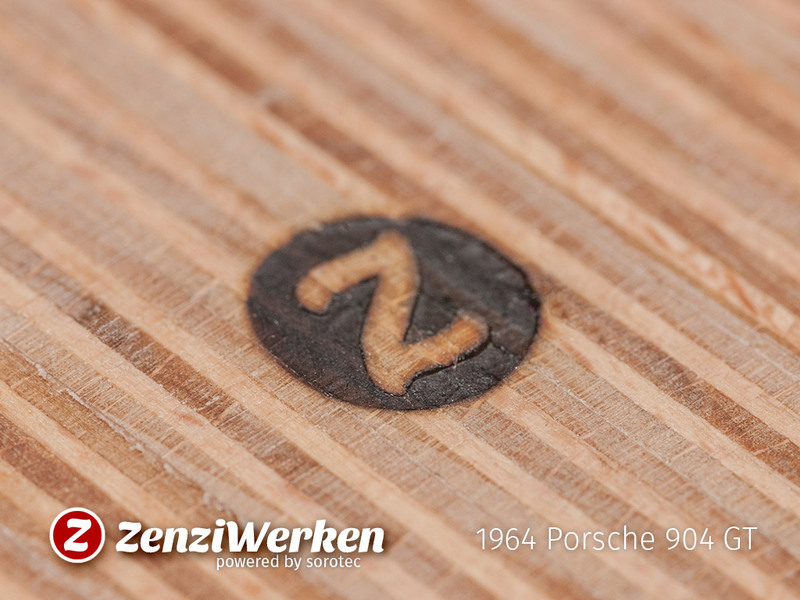 But sometimes a single detail gives this little extra cnc-ish flavor. 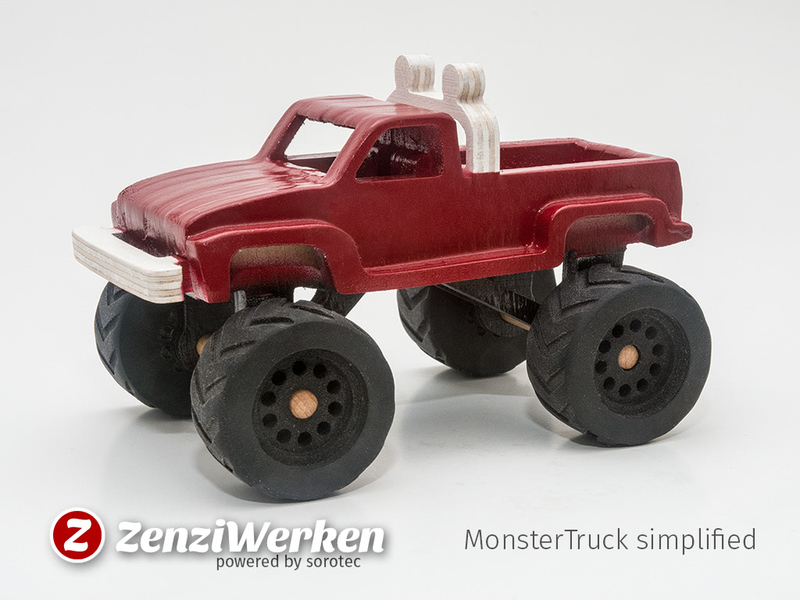 In this case, the tires are engraved to get the cool thread that is the main feature on monster trucks. 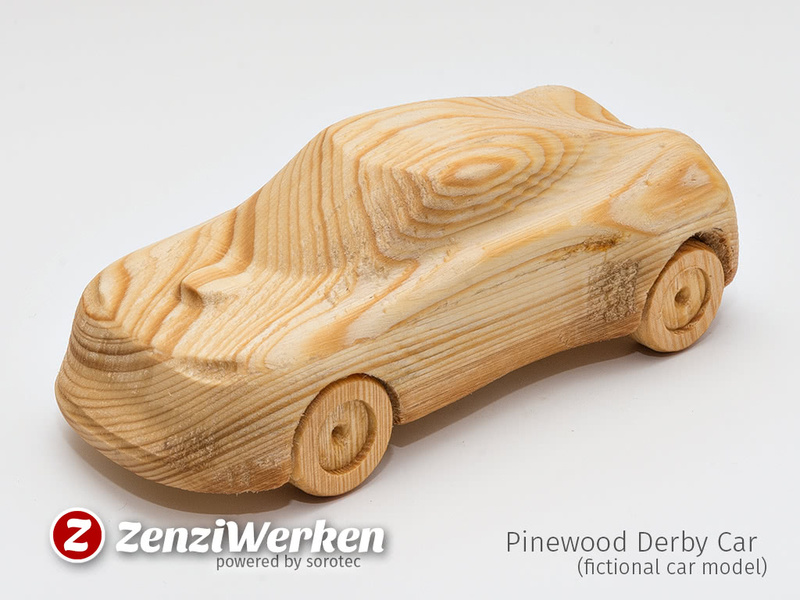 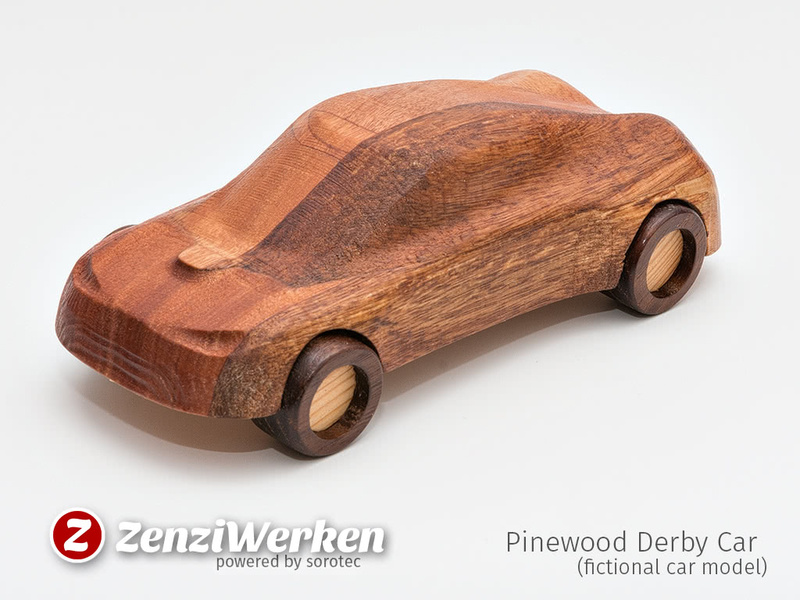 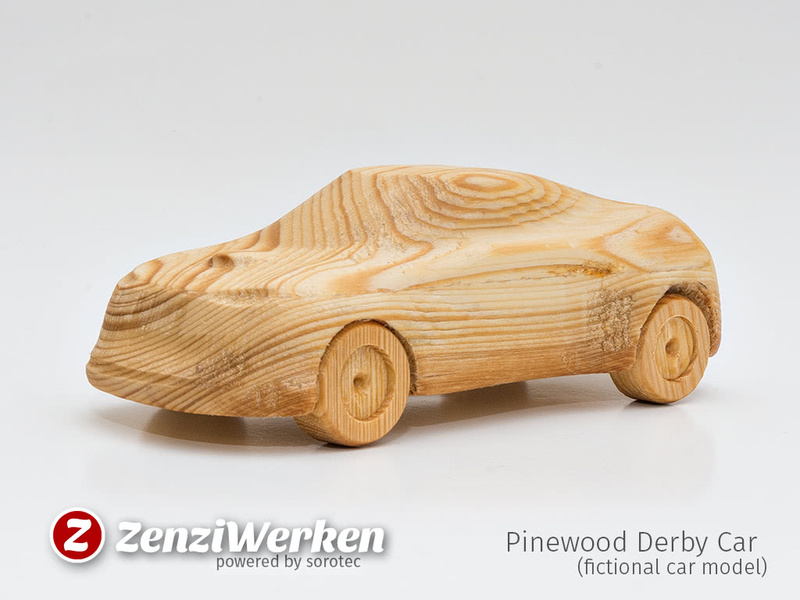 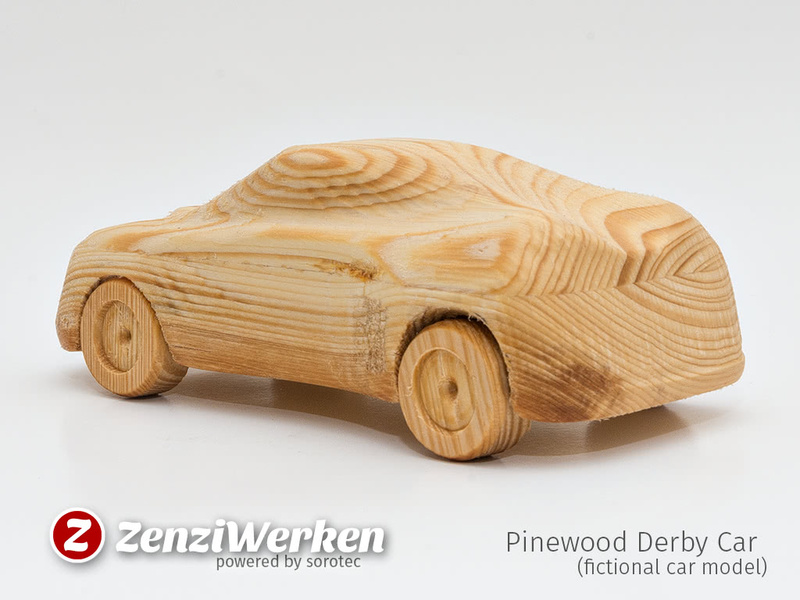 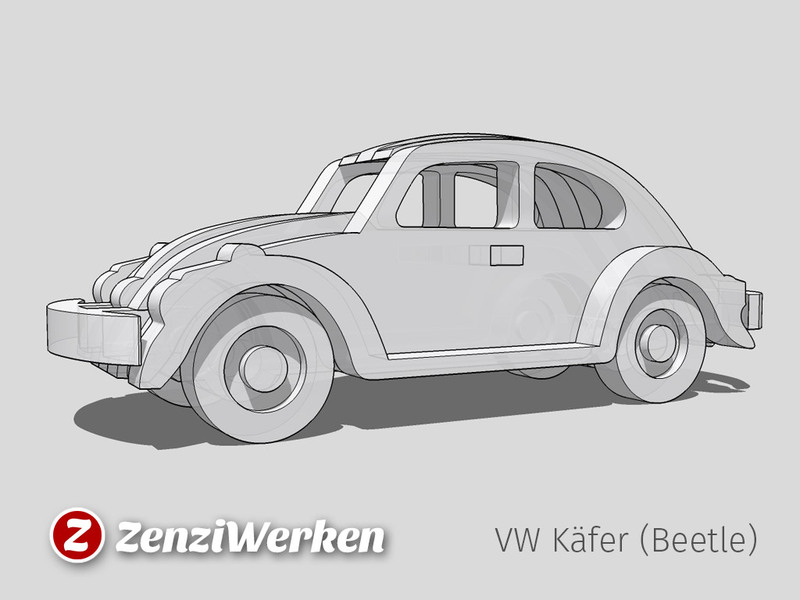 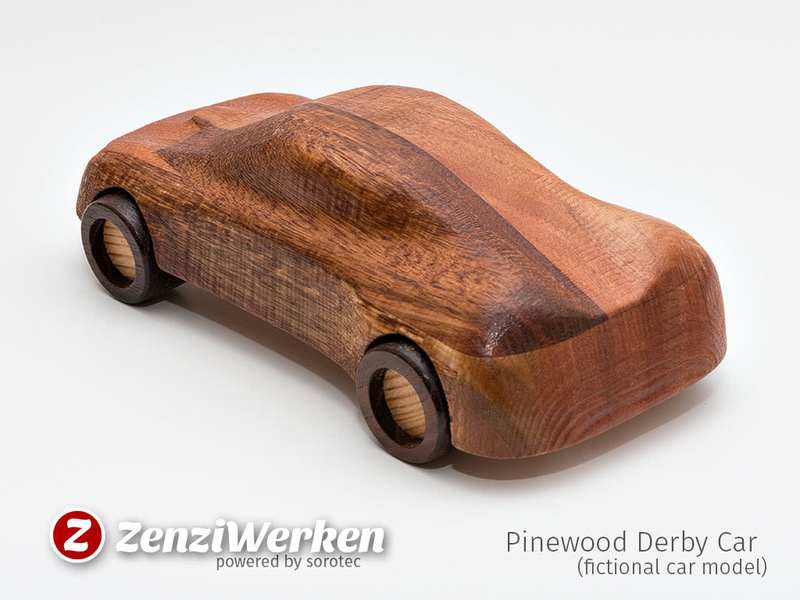 This fictional car model has some resemblance with a Rallye car. 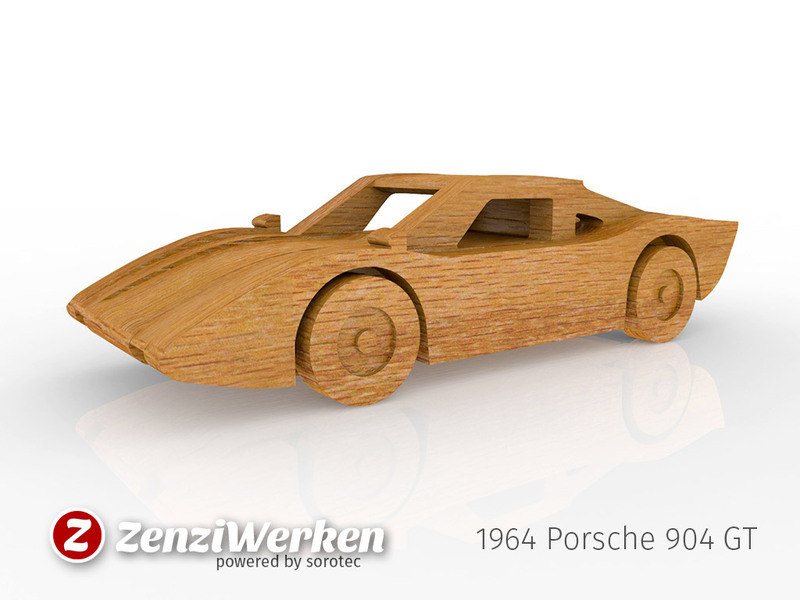 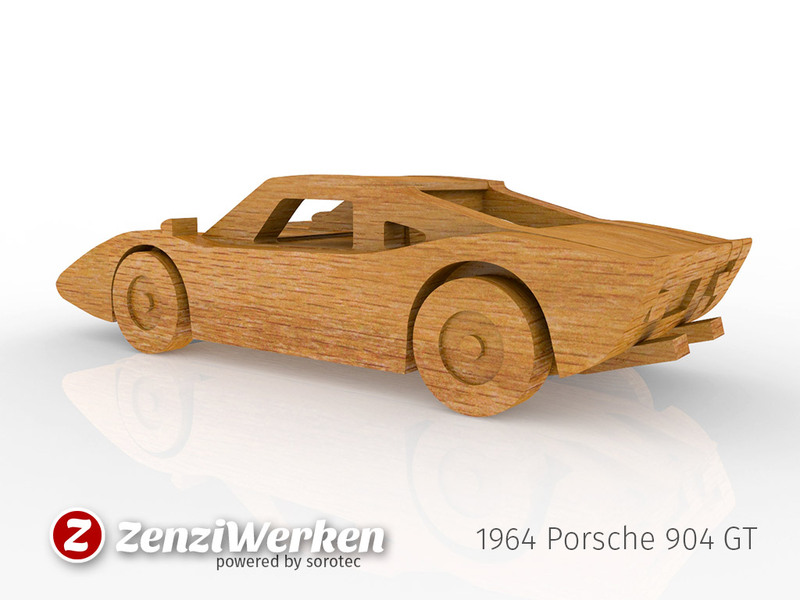 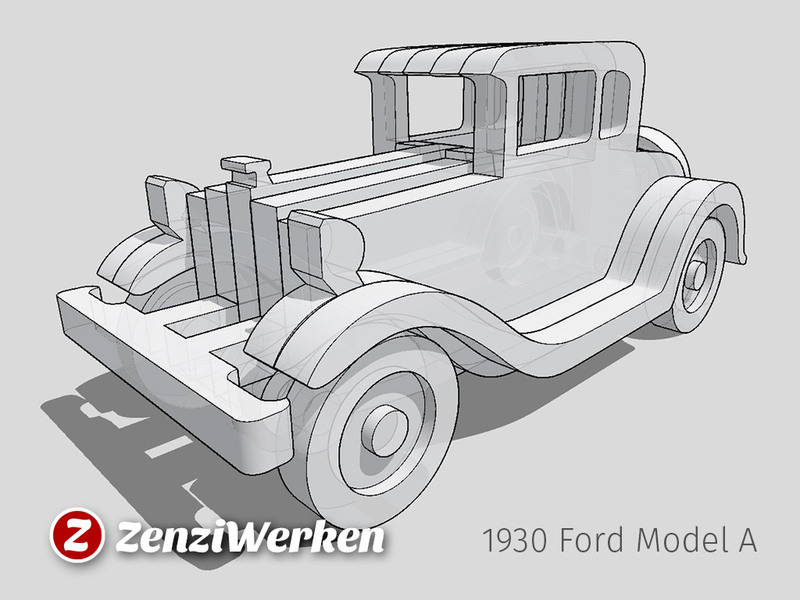 The type of design differs greatly from my other car models as it's a real 3d-object not stacked slices. 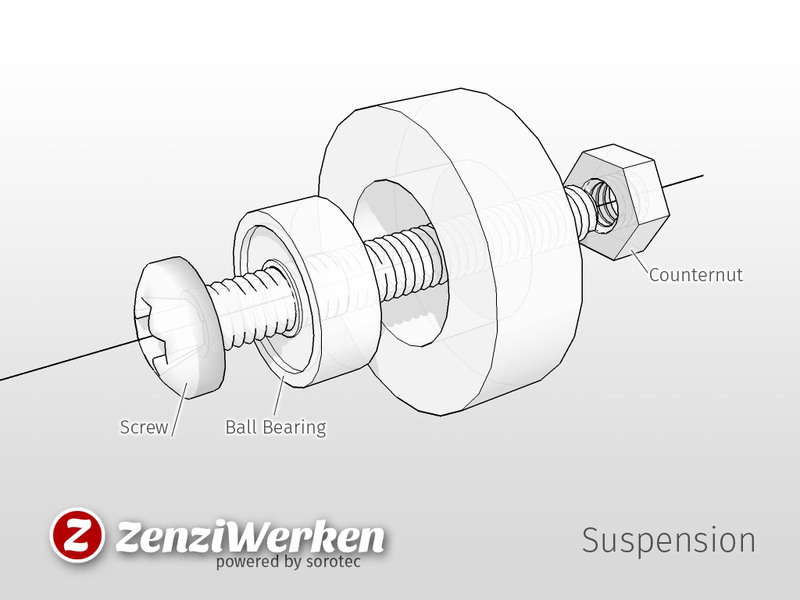 I wanted to try of the 'Sculpt' functionality in Fusion360. 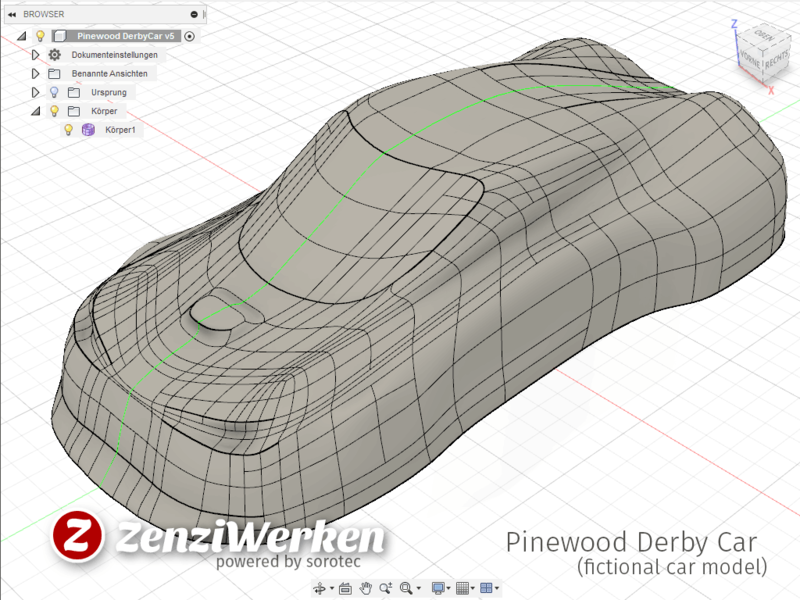 It works a little like digital clay but it focuses more on technical design than Sculptris I used for my Toothbrush Stand „The Snout“. 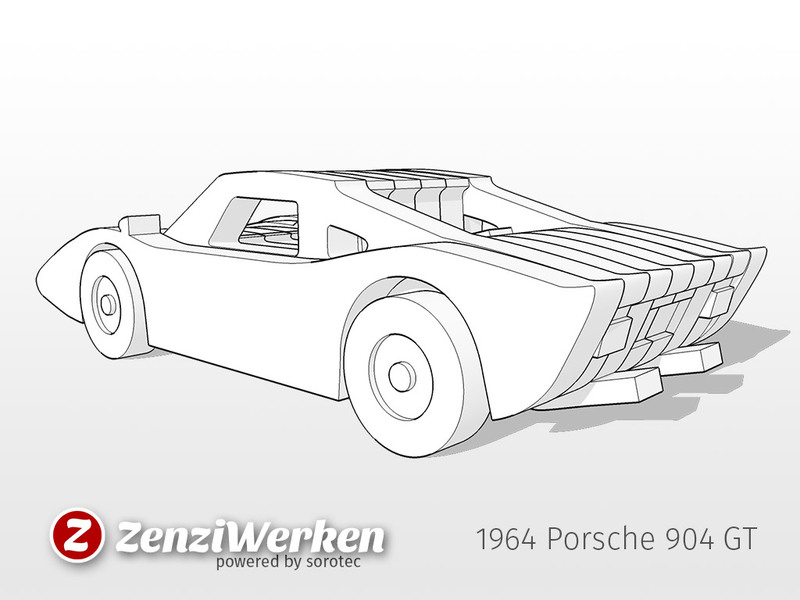 I got an application for making another simplified layered model. 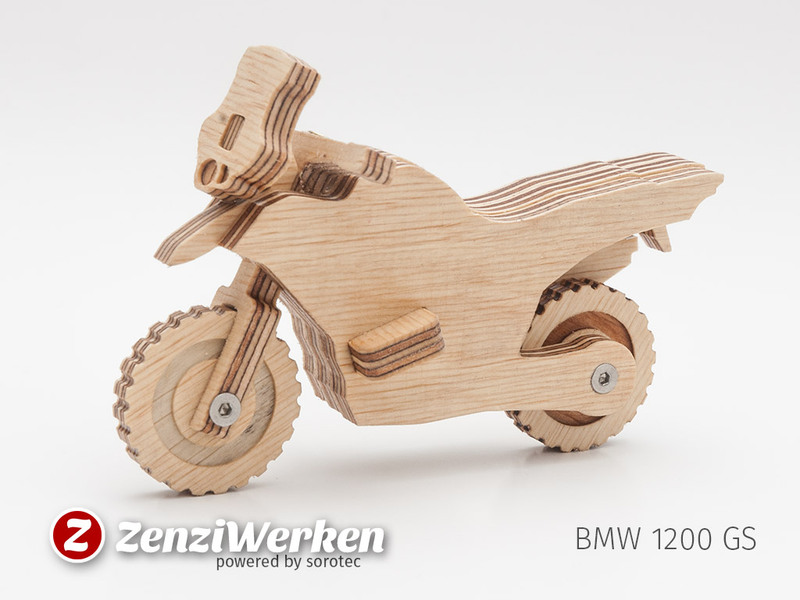 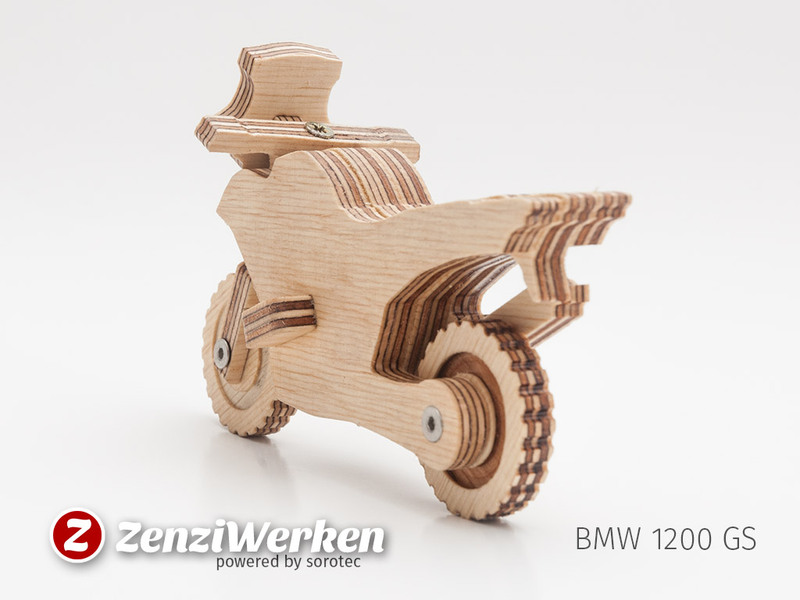 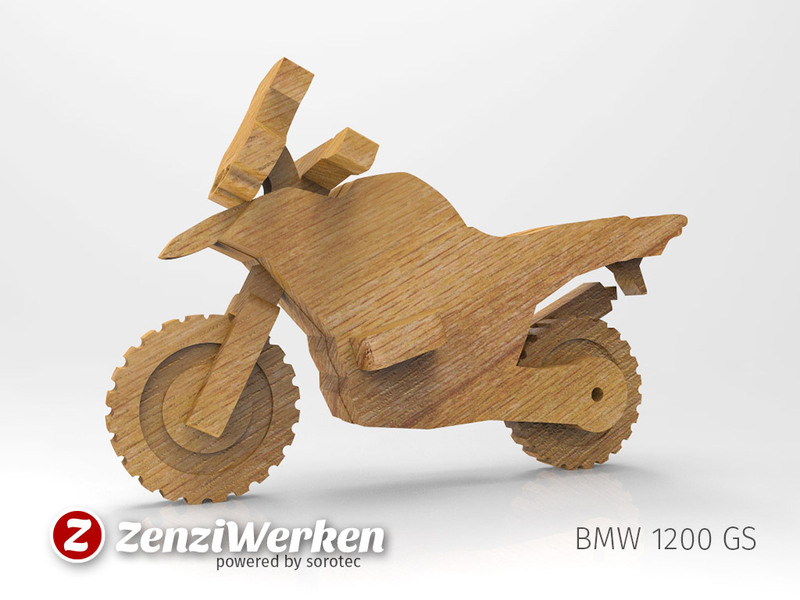 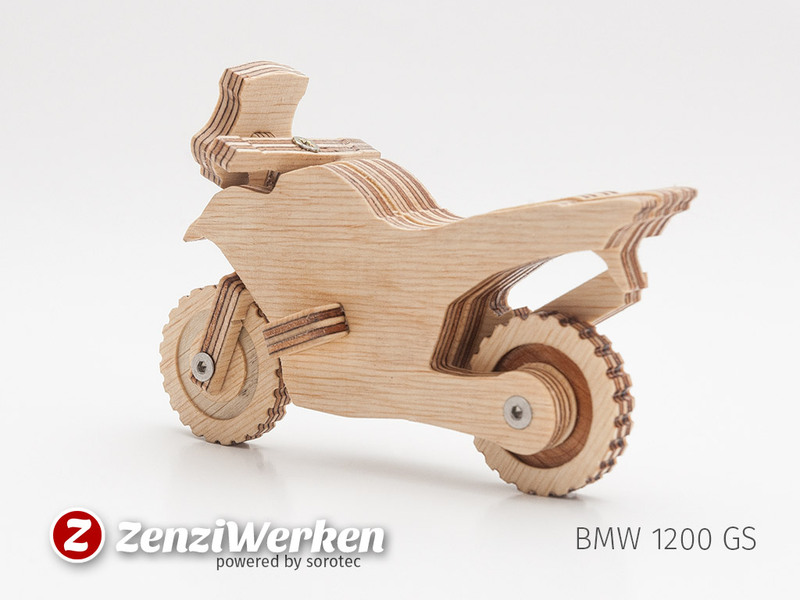 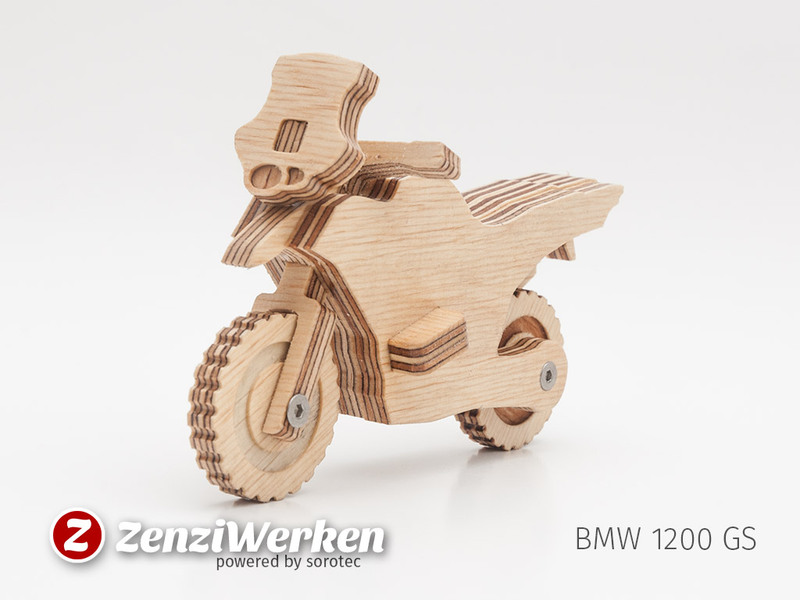 This time a motorcycle of the Bavarian manufacturer BMW. 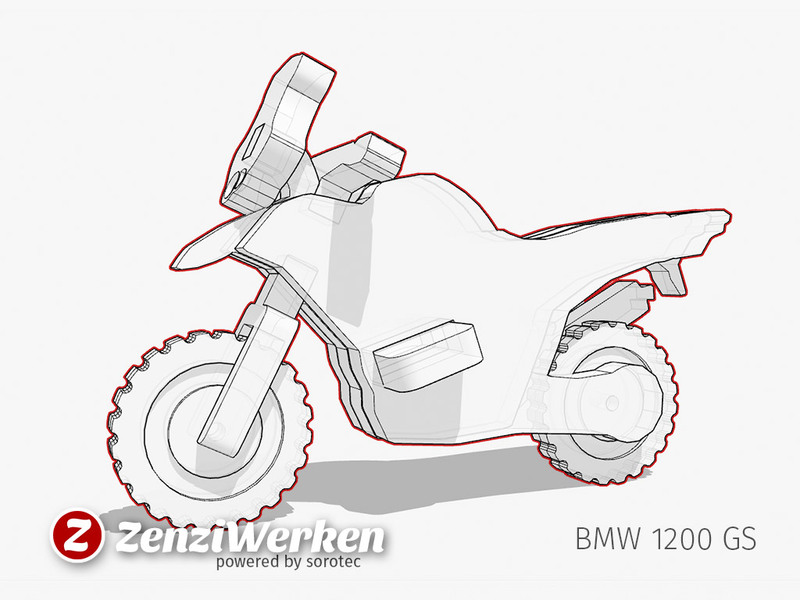 The 1200 GS is a pretty big offroad machine with – as the name suggests – 1200 ccm in a two cylinder boxer motor. 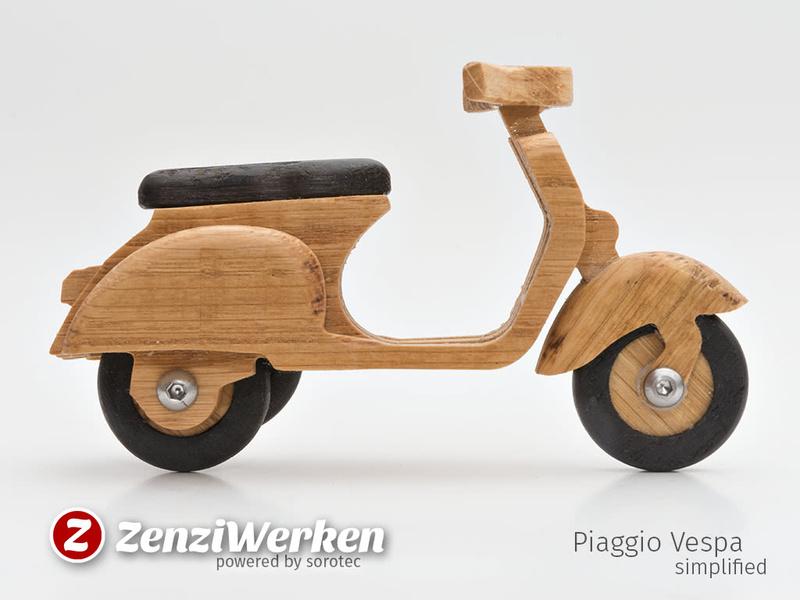 Actually, I had a predecessor of the bike and I really liked it. 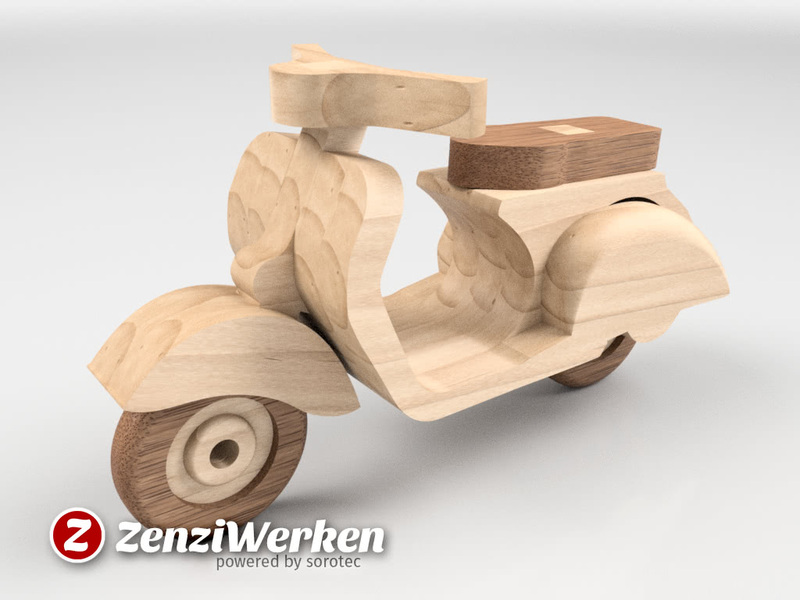  Download buy me a coffee commercial license? 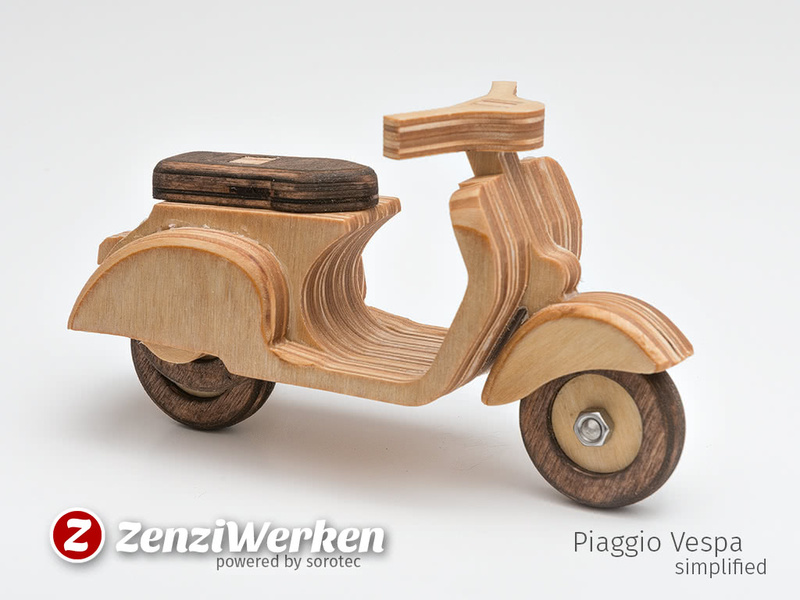 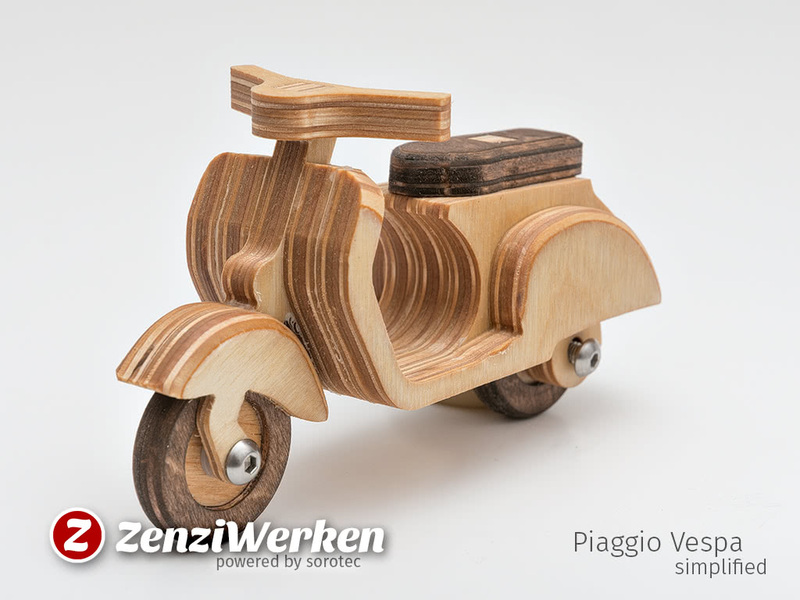 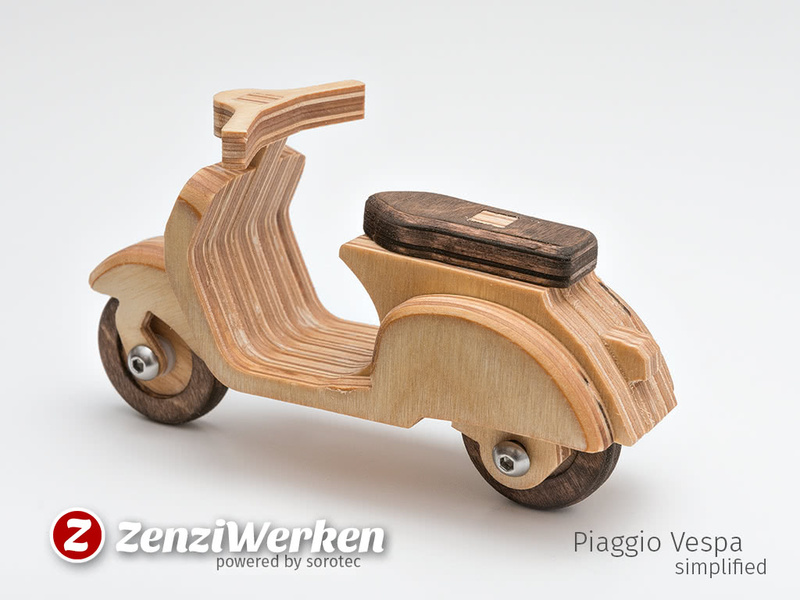 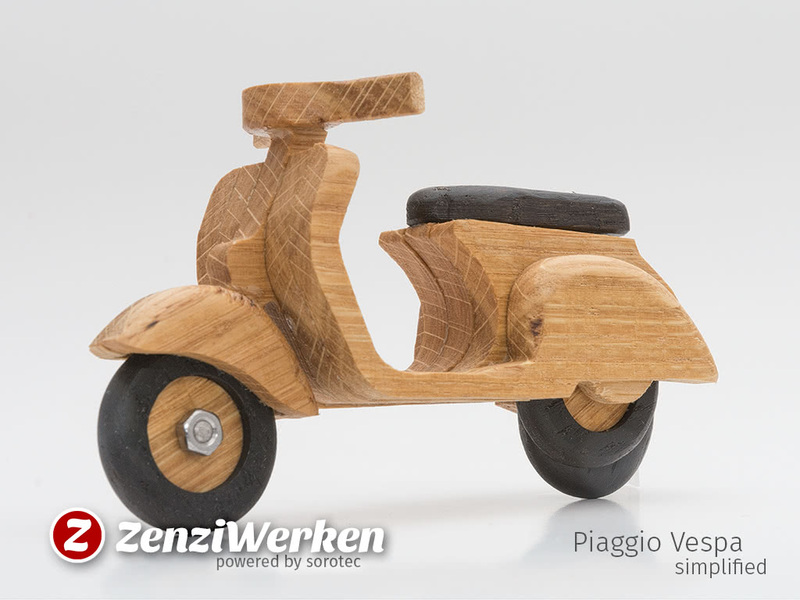 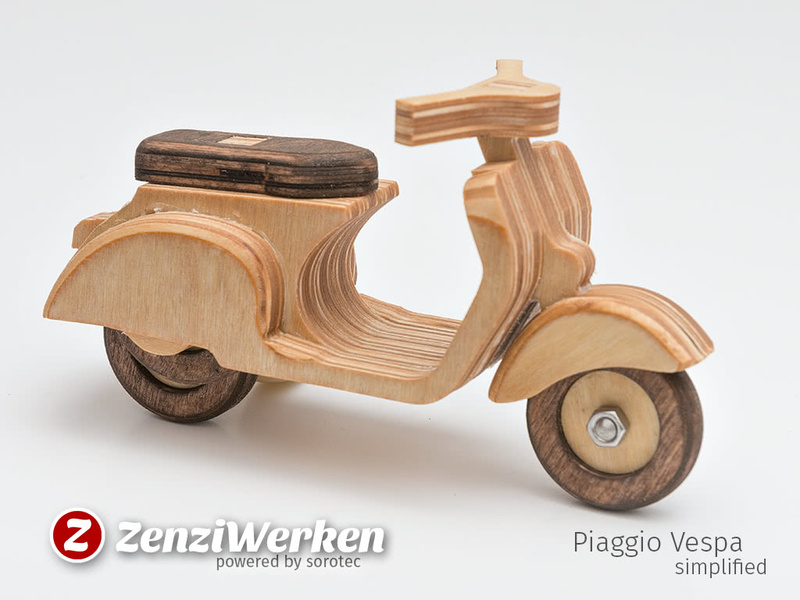 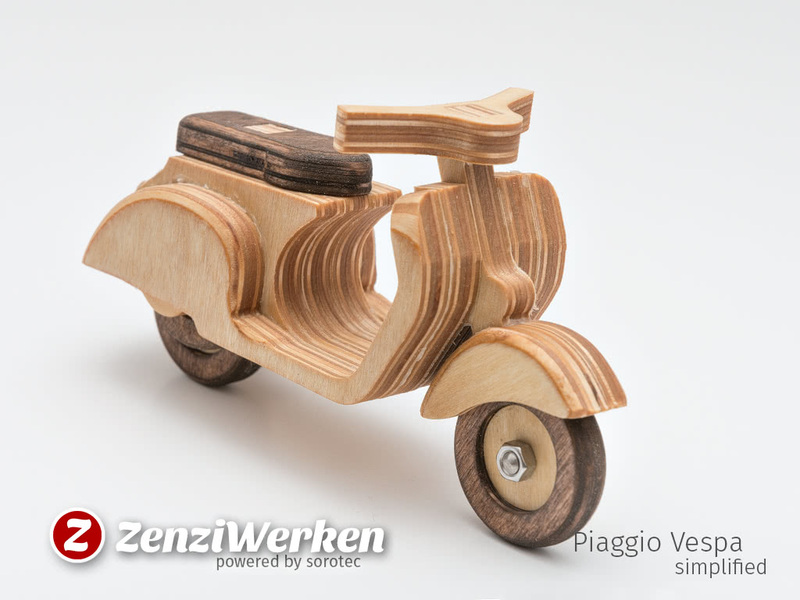 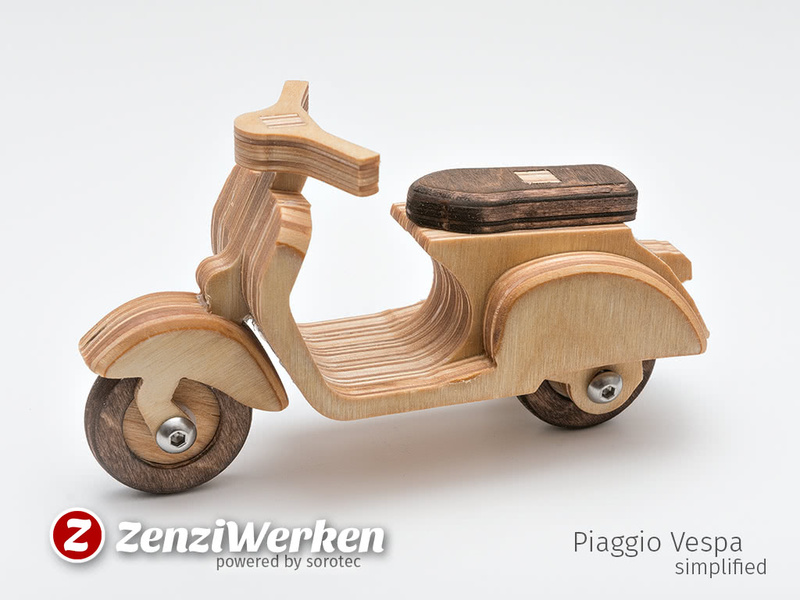 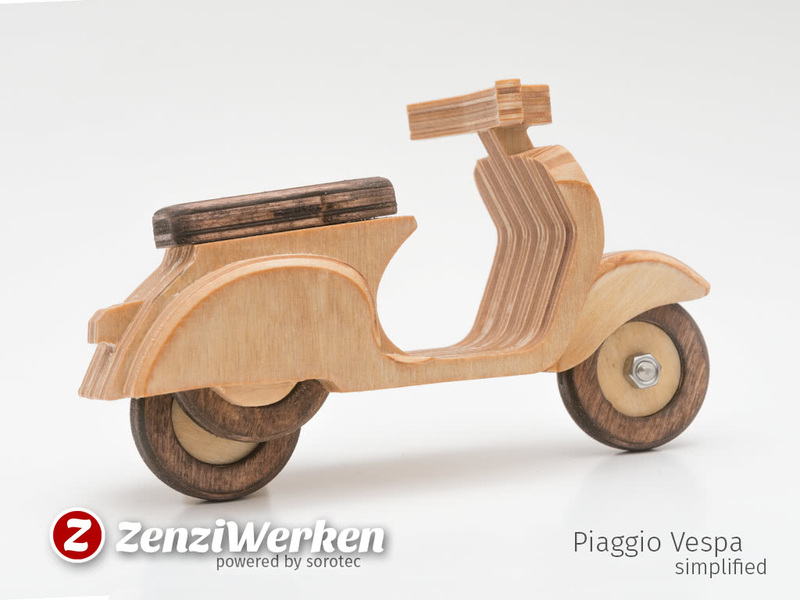 This design was a request of a reader who is part of a Vespa club. 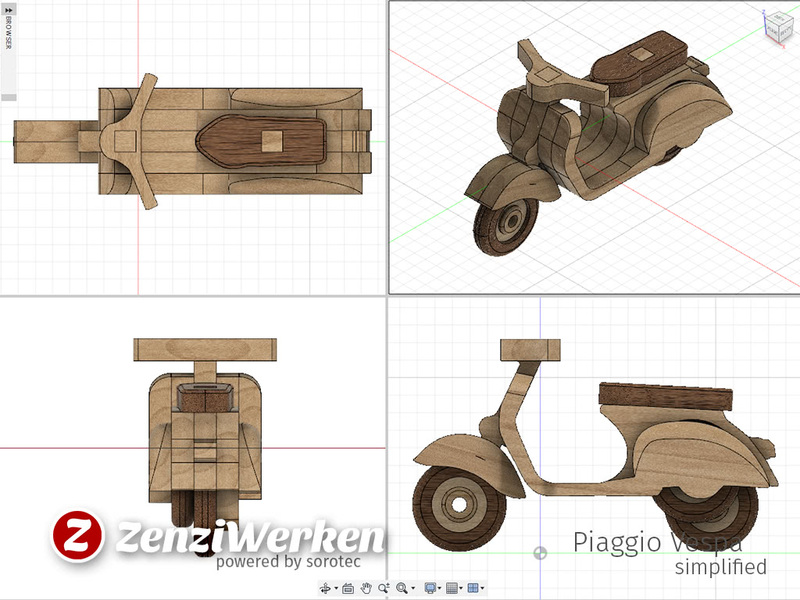 He asked me if I could draw a simplified model of the classic Vespa. 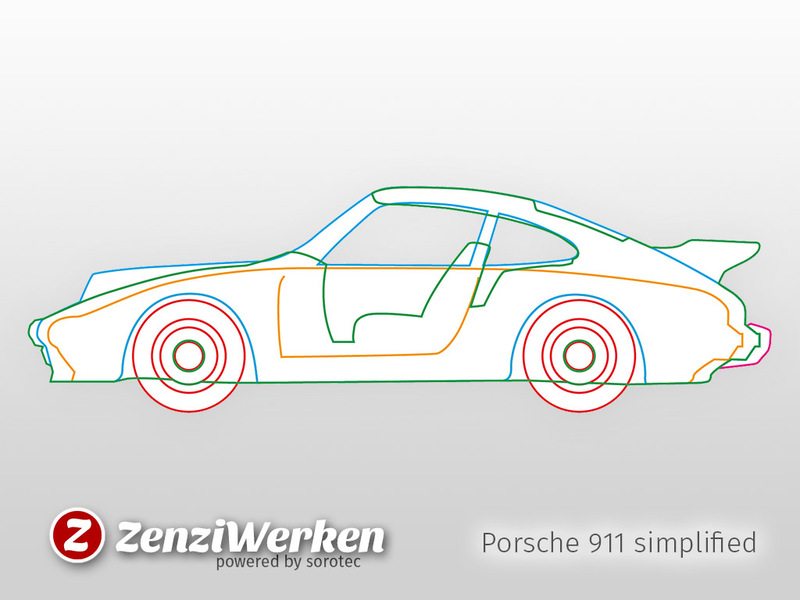 My simplification did work surprisingly well. 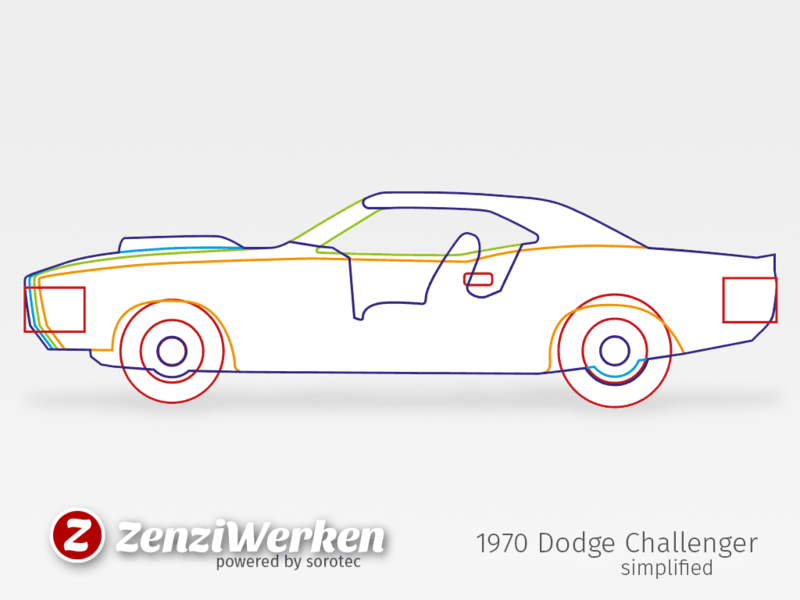 A few round overs helped to show the distinctive features, especially the fenders. 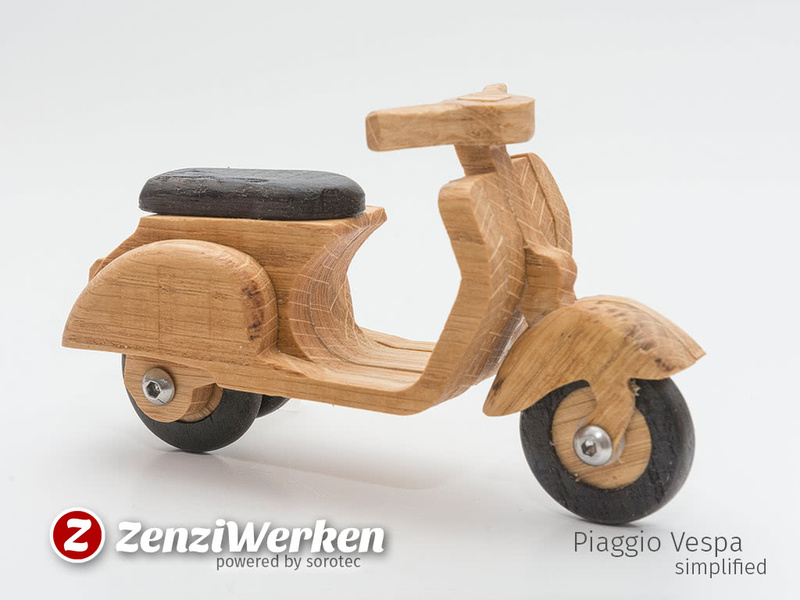 I am not the biggest fan of motorized vehicles as such, because of the negative impact they have on the environment, but I adore the design language of this Italian beauty.